Marjorie and Kevin walk down the graduation aisle to receive his first diploma. ISWA kids showing off their studies. 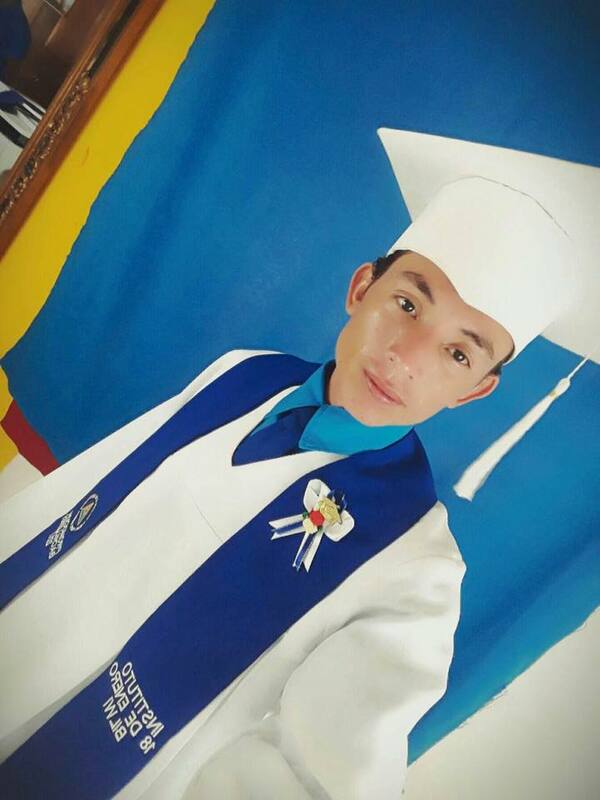 Congrats to Cesar who graduated into high school for 2017! You are the man, Cesar! It can be very unpredictable...who will graduate or who will/will not succeed. Cesar had us on the edge of our seats this year and in the end, he set an example for the other kids in the program. This has been a long journey for all of us and we have all struggled in our own ways, but we took these steps together. Cesar passed both 5th and 6th grades this year and will advance into high school in 2017. We are so proud of your effort and not giving up! 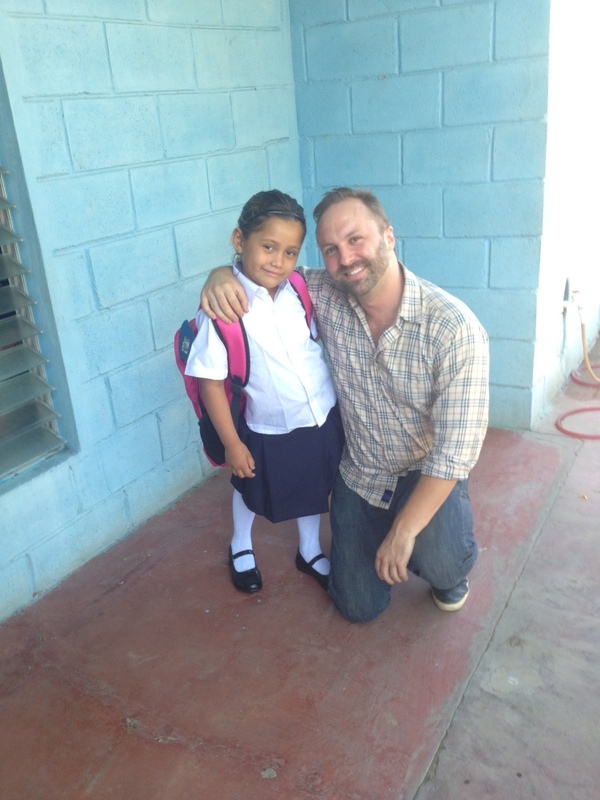 Thanks to ISWA and Cesar's sponsor, Jonice for making these first steps possible for us! A few kids from with their exercise uniforms from the private school. ISWA (International Solid Waste Association) and Timothy Bouldry met years ago at the 2013 Methane Expo in Vancouver in Canada which was hosted by the EPA (United States Environmental Protection Agency). 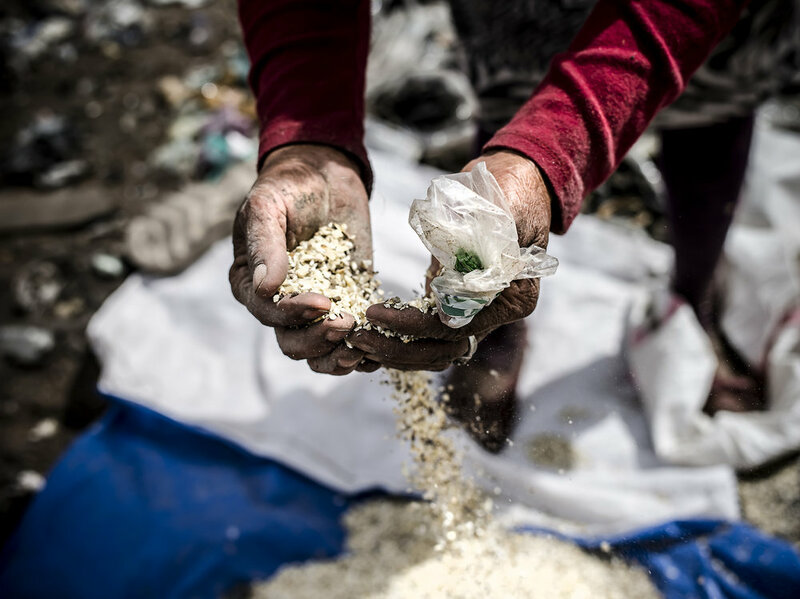 Environmental photography was a growing need and the communities living and working in the informal sector from dump sites were becoming a more reoccurring theme and an important topic to consider for organizations taking an interest in improving the environment in developing nations. In 2015, ISWA invited Timothy Bouldry to give a presentation on health risks for communities living in these conditions at their ISWA World Congress '15 in Antwerp, Belgium. This opened a discussion about what would best help a community like this and from there The ISWA Scholarship Program was inspired. 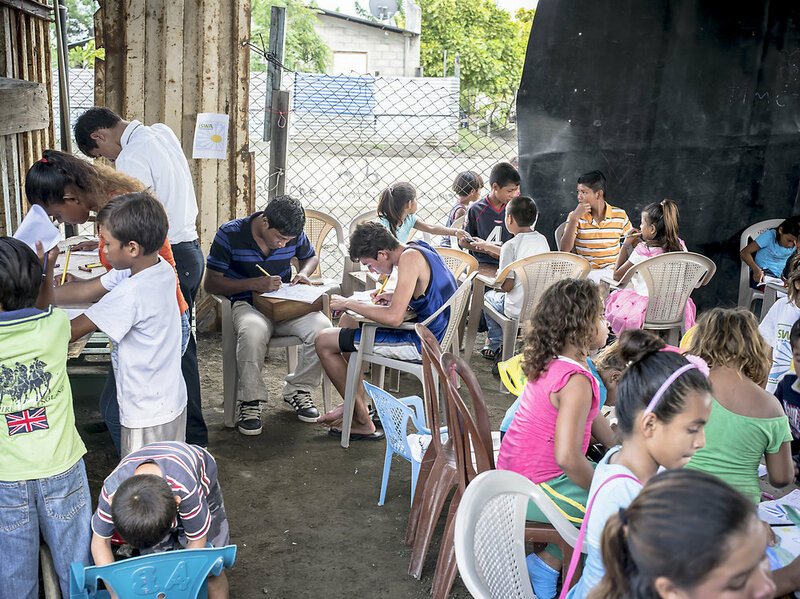 President of ISWA, David Newman, and the board of directors provided funding with the idea of removing 15 children from Managua, Nicaragua's city dump known as La Chureca and providing them with a quality education for two years. Since that short time ago, the programme has expanded to 25 kids and is rapidly including more kids and for a longer duration of time. The concept is for the program to change and inspire the minds of the youths affected by informally working in trash dumps. It is also designed to carve a path away from the dump for the coming generation especially as dump sites are closing down and, little by little, are becoming forbidden entry. 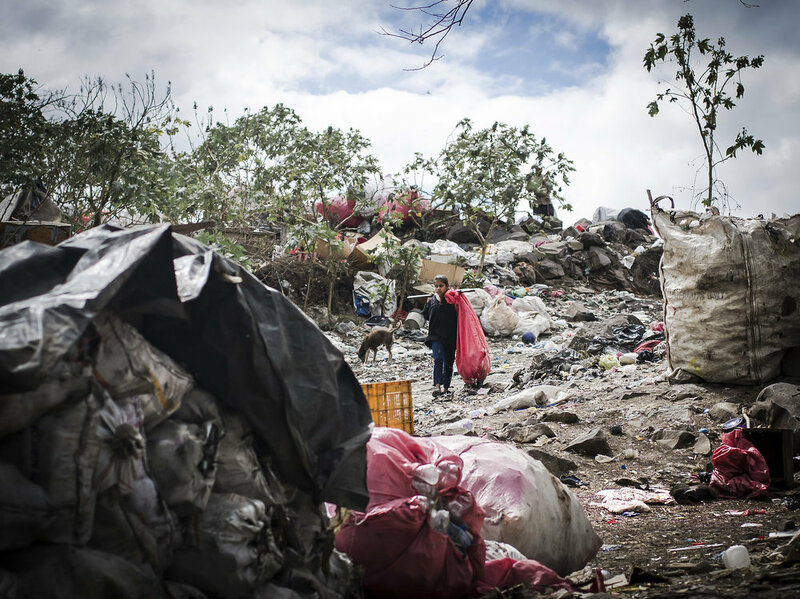 Dump sites are not a healthy environment for families and informal workers. Therefore they should be shut down and converted into properly functional landfills. However, there are various obstacles in the way for the people making a living there during this transition. Here are two great articles by Zoe Lenkiewicz that talks further about this complexity; Valuing Waste, Valuing Those Who Depend on Waste and Silver Bullets of Stepping Stones: The Future of Waste. 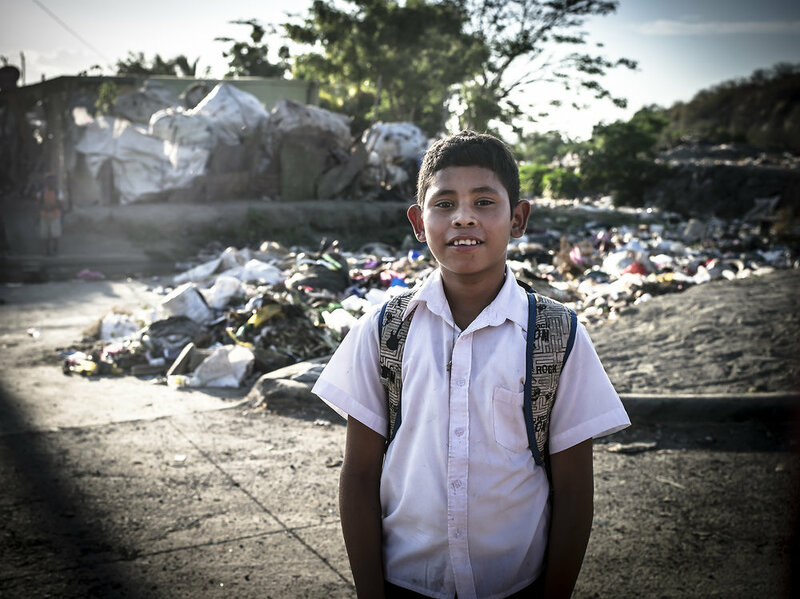 The program starts with Timothy Bouldry venturing into two main trash dumps; La Chureca of Managua and Nueva Vida of Ciudad Sandino, in search for children who show a desire to leave the dump in order to go to school. 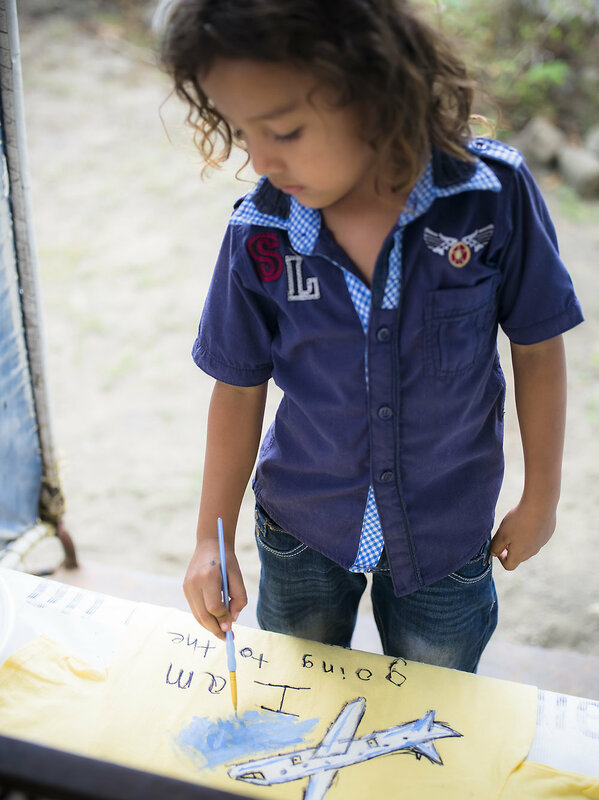 The next step is to interview the children and families to clearly understand their stories. 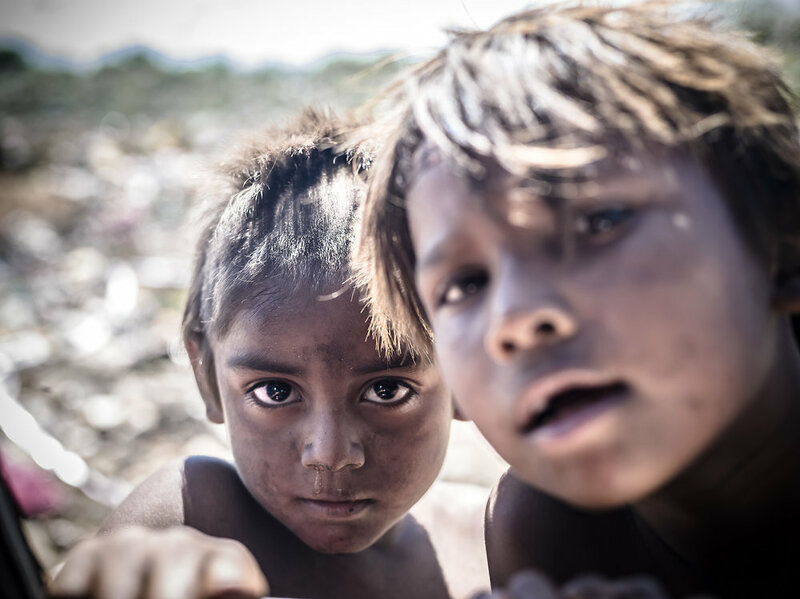 If their committment to learn is genuine, then the parents and children sign contracts stating that they will stay out of the dump and focus on the programme. They are next considered to be placed in a fully funded private school programme away from the dump. In many cases, the child is of an age much older then their grade and will not be accepted in a private school. Therefore, we place the child in a "Ciclo Programme." The Ciclo Programme helps older children catch up to their respective grade. In order for this to happen, the child must work hard and show their honest devotion towards their studies and their future. If they succeed in this, then they will be rewarded with necessities for the family and another opportunity to go to a private school the following year. 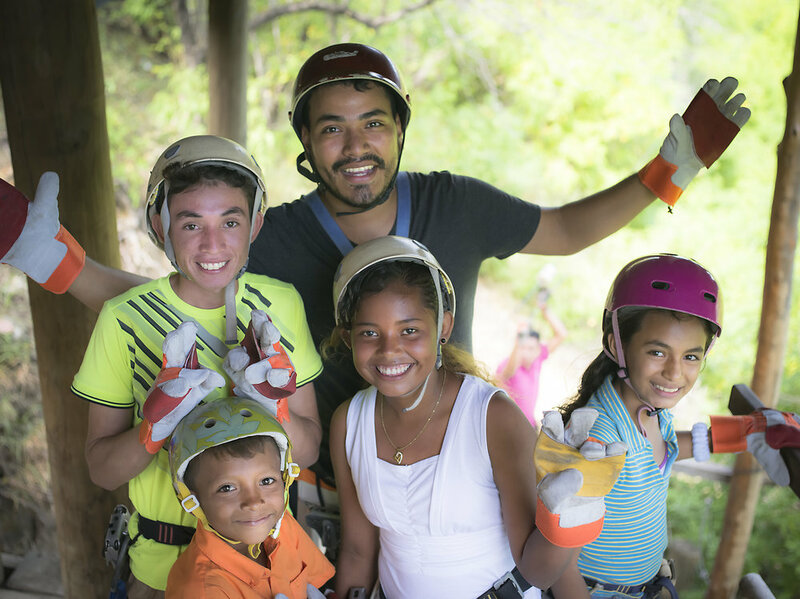 The Ciclo Programme currently consists of 10 kids (6 from La Chureca and 4 from Nueva Vida). 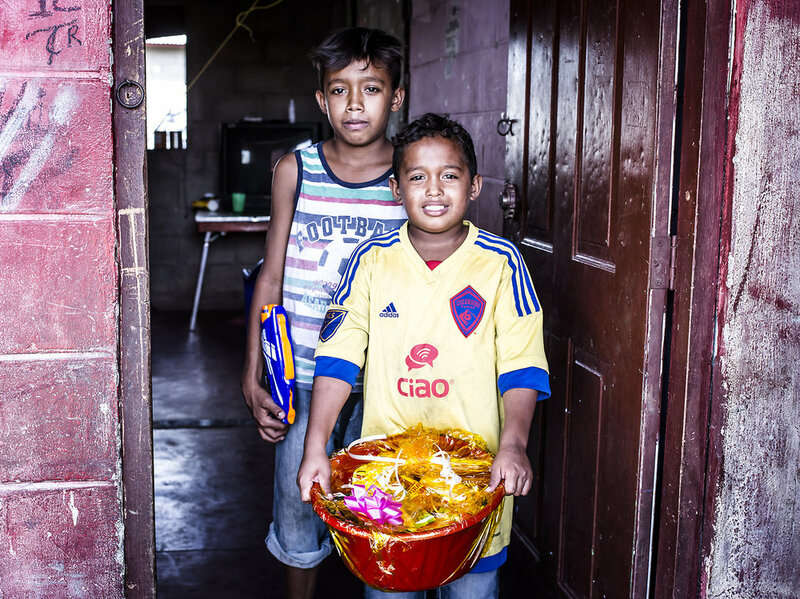 All are provided with everything they need for school. The private school group go to Colegio Bautista El Calvario. 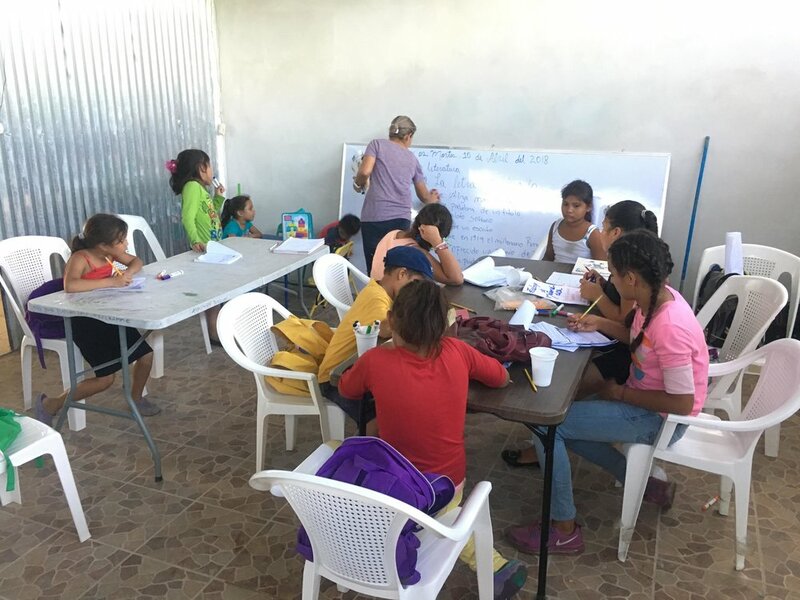 They are provided with transportation, uniforms, gym cloths, book bags, all school books, materials, full health coverage, semi-private tutoring 3 times a weeks, 2 weekend classes of English and Sponsors. 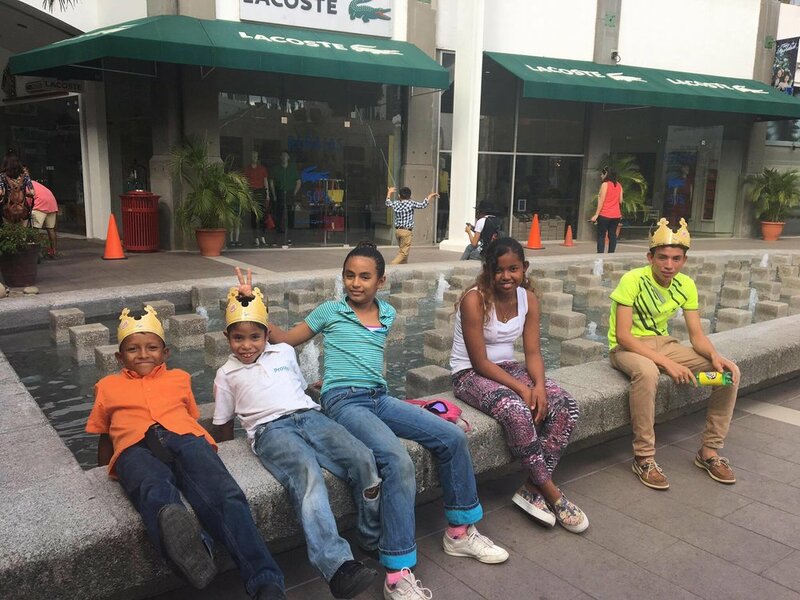 The Private School group consists of 15 kids (14 from La Chureca and 1 from Nueva Vida, school: El Gues). ISWA has planted a solid foundation for the programme and the sponsors have helped build a further structure for the kids. 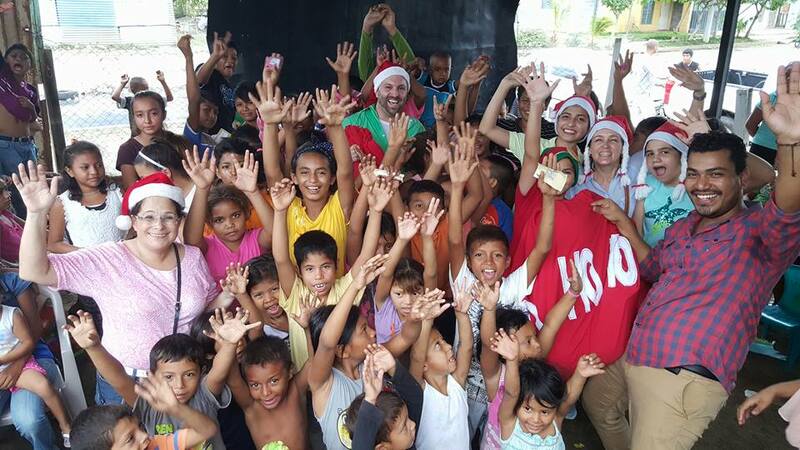 Right now we have 18 kids sponsored (14 from La Chureca private school group and 4 from La Chureca Ciclo Program). 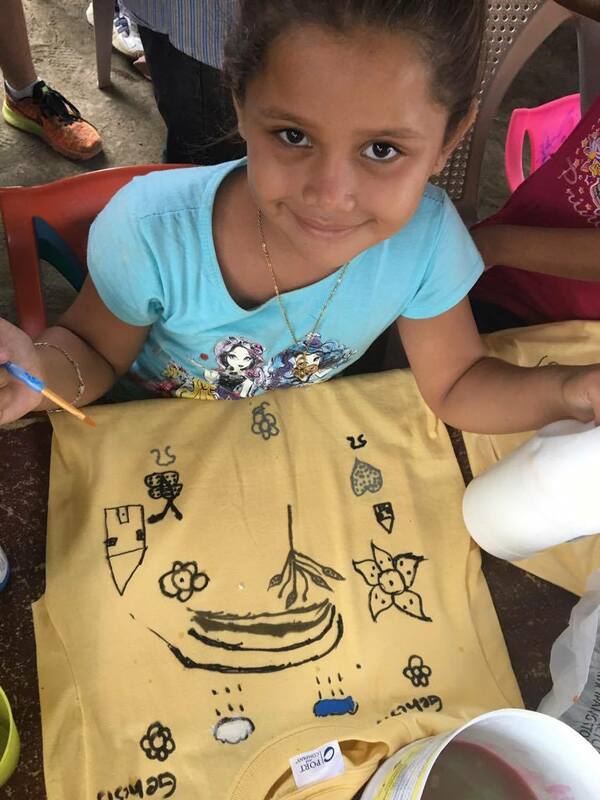 The sponsors have not only funded the children's transportation, but have made additional programming possible, tutoring and additional necessities when needed like extra school supplies, home improvement, food or dental work for example. The sponsors also are moral support for the kids by sending messages of encouragement and little gifts when they succeed in something new. Parent/Student meeting to discuss their progress and what's next in the program. 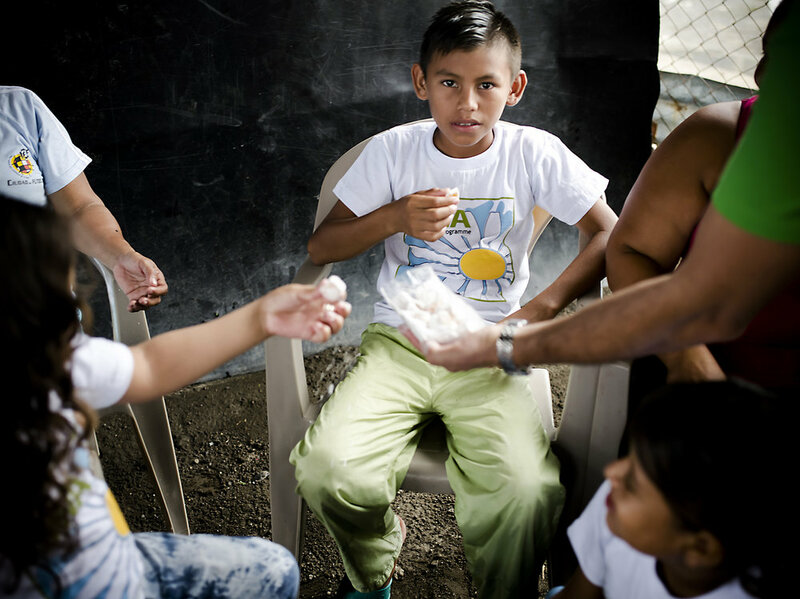 Jose Angel was born in Managua City’s dump known as, La Chureca on April 10th, 2003. His father was a very high ranked Sandinista during the late 1970’s and early 1980’s. During the war the father was captured and tortured by the Samoza party. He later escaped during the time when the Sandinistas won the war. However, both parties were corrupt and many Sandinistas were being placed in jail. Instead of announcing that he had survived, he returned to a piece of land that was given to him years ago. A piece of land now accompanied by La Chureca. In search for a simple and religious life with God, he met a woman who he would have Jose Angel with. The mother soon grew tired of them and left the family for another man. However, she later came back for Jose Angel to take him into her home. Later the father found out that she was using him like a “slave” and took him back and has raised him ever since. 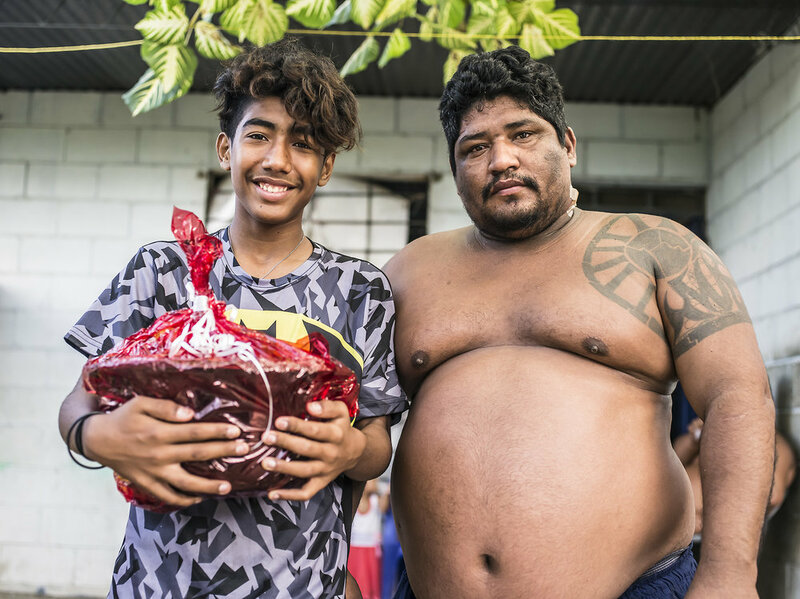 The father is able to recall having 16 children (the youngest being 3 yrs old and the oldest 42 yrs old, but he is the closest to Jose Angel. The father has always had a gift for finding metal in the dump and hand-making grill sets for kitchens. 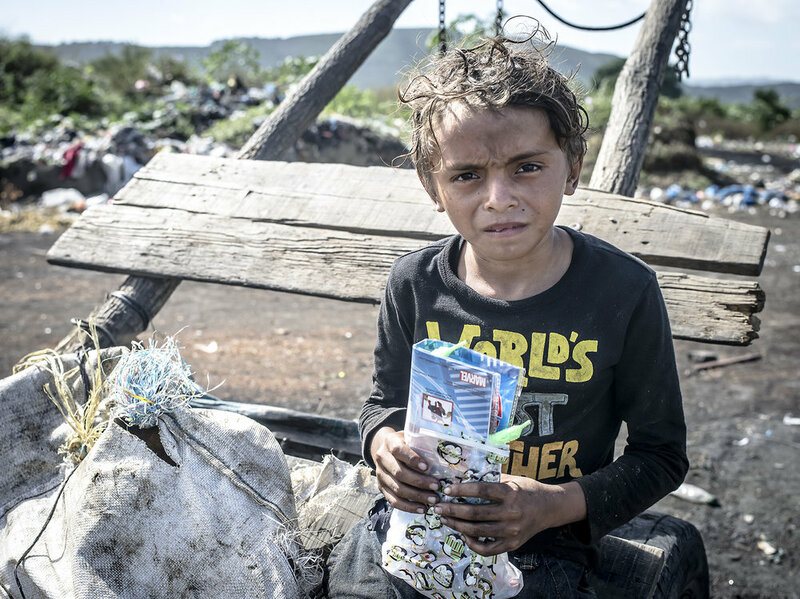 Jose Angel helps him scavenge materials in the dump to build and sell. 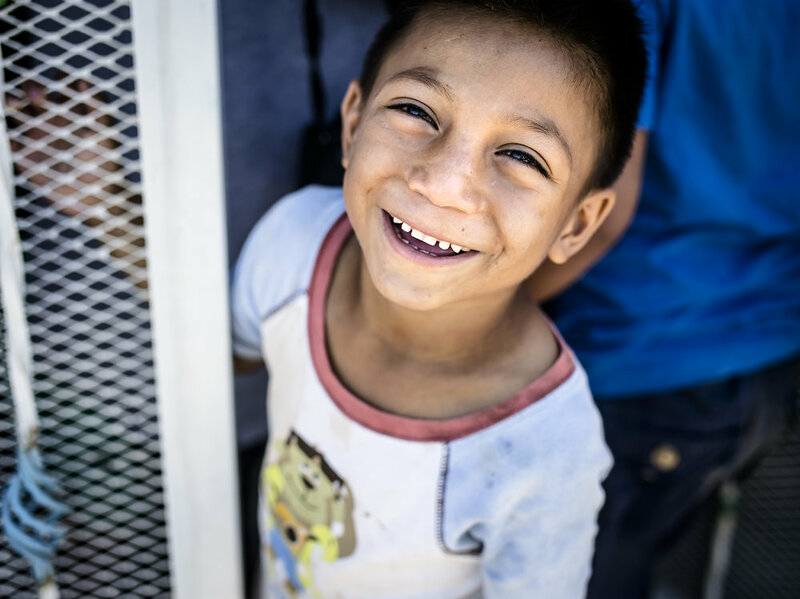 With the little money his father could earn, he would use towards food and Jose Angel’s education. 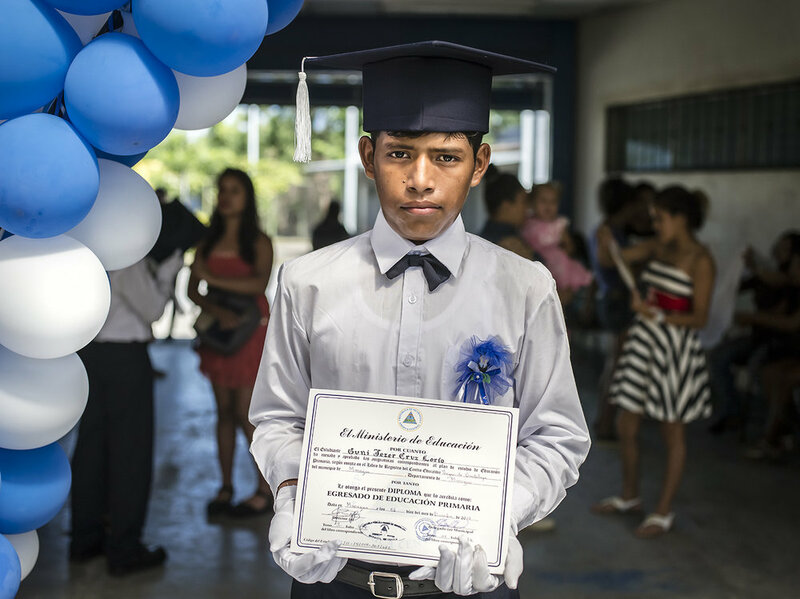 The father and Jose Angel are very grateful to be in The ISWA Scholarship programme. 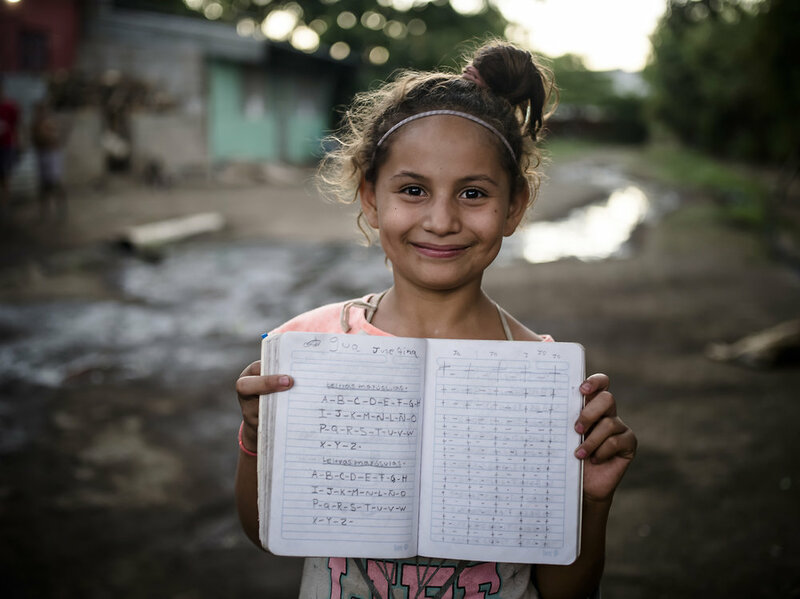 Sara was born in Managua City’s dump known as La Chureca on February 4th 2002. 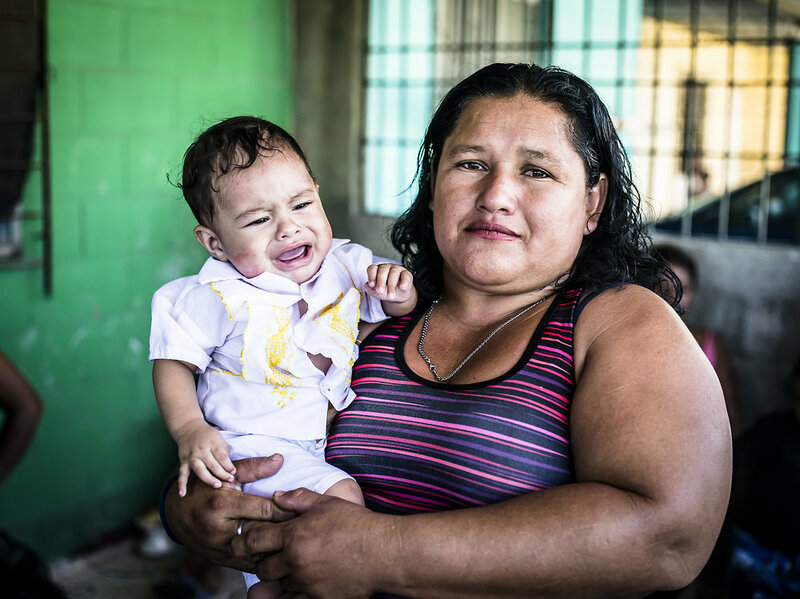 Before Sara was born, her mother heard of free land beside Managua Lake. When she arrived she realized the land was just miles of trash, but she decided to stay and make a home alongside the dump. 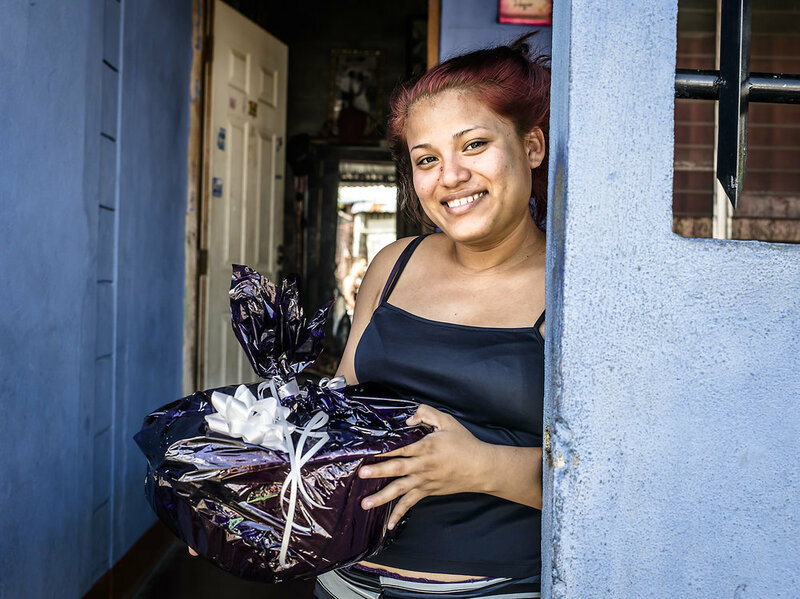 She was one of the first people to settle in what was soon to be known as La Chureca and she has since worked there for 21 years. She immediately began recycling the garbage that came in and that was the type of work she would always do and know for herself and the family she would start there. The mother recalls the harshness of the living conditions and when Sara was between the ages of 1-6 years old she had severe asthma issues. In those years, they spent more time in the hospital then at their home. At one point, Sara had one lung that completely failed and the family thought she would die. Sara’s mother put her on a strict diet and had her consume herbal teas and from there she gradually healed. The father wanted to move the family to the Atlantic coast to start over. For the family, life in general was much easier, but the father was a raging alcoholic and would abuse Sara and her siblings. The mother eventually became fed up with the abuse and decided to take her kids and move back to La Chureca. There was a rumor at the time that there would be a housing project for the “waste pickers”. So she returned and continued to informally sort garbage with her kids until the housing project finally pulled through. 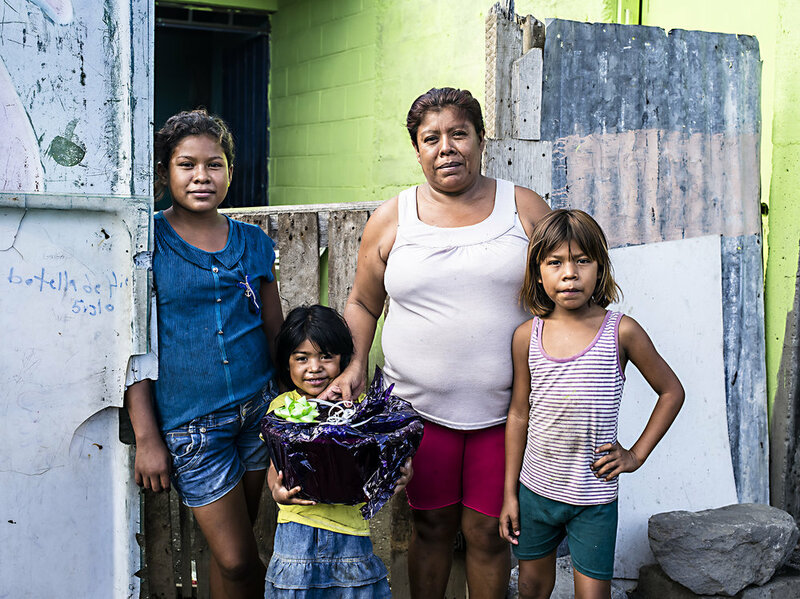 Today, they live in a concrete home rather then a fragile house made from found trash. Sara has been climbing up to the dump to find materials to repurpose, recycle or resell to help bring food into the family. 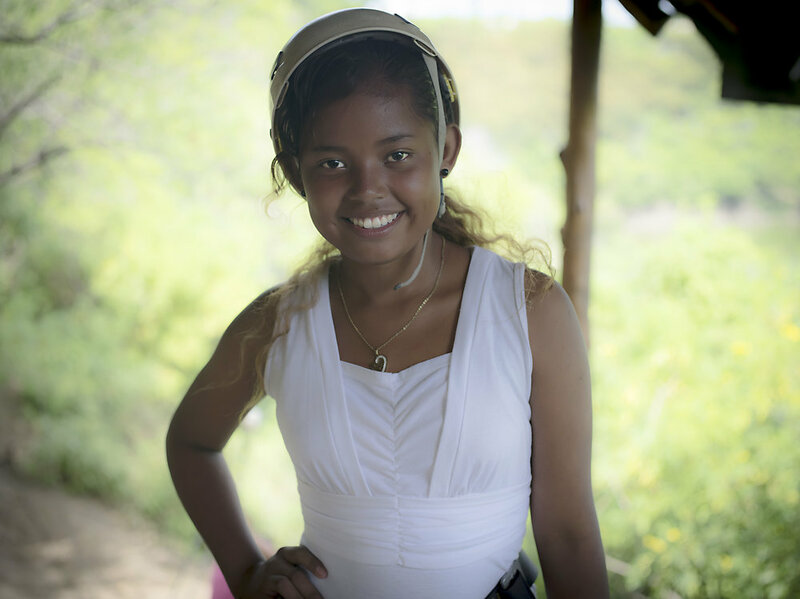 However, since she has began The ISWA Scholarship Programme, she has not returned to La Chureca and her focus right now is succeeding in school. I knew she was right for this program because when I told her she received the scholarship she was emotional and gave a big sigh of relief. 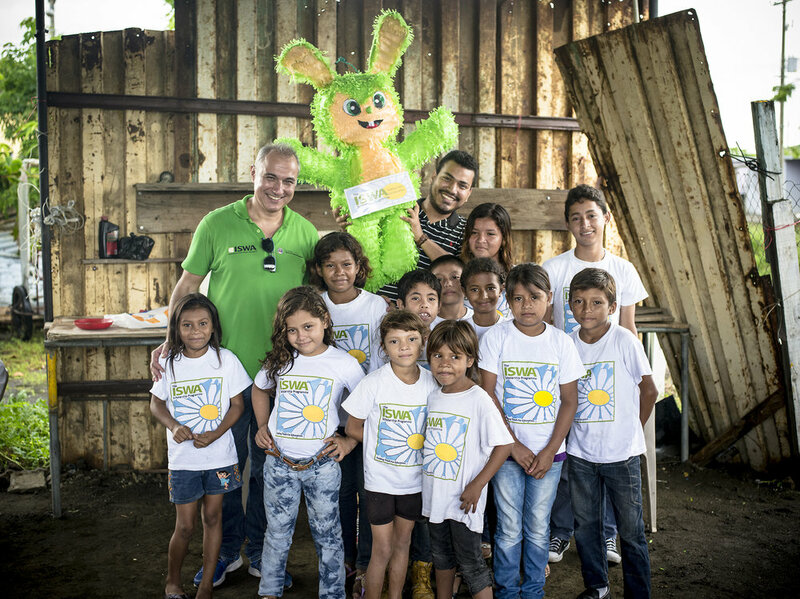 The kids and Timothy Bouldry inside La Chureca after the program was announced. 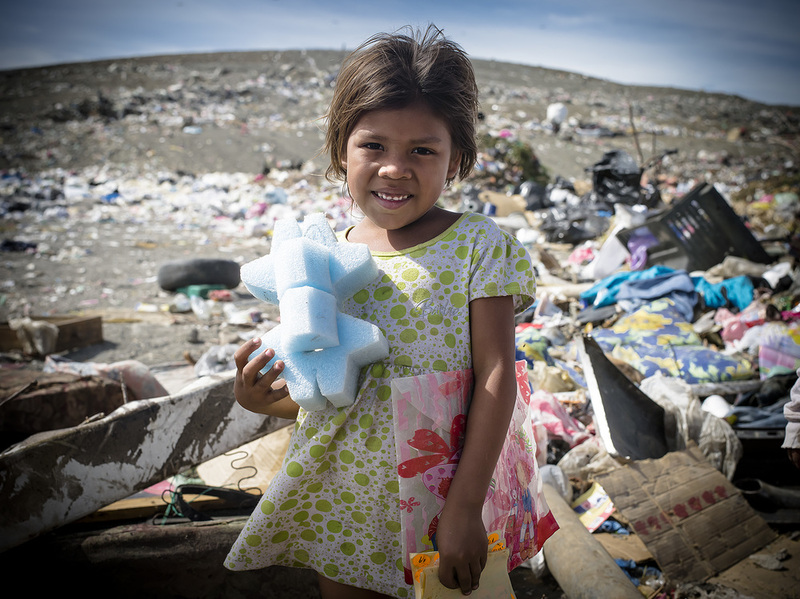 Noemi was born on June 6th, 2001 in Central America’s largest trash dump, La Chureca. Her mother was born there as well and her grandmother moved there well over 42 years ago. She was raised since she was a child to recycle materials for money. Her father was also a fisherman who would fish in Managua Lake. At that time, Managua Lake had a reputation of being one of themost polluted lakes in the world. When Noemi was 22 months old her, father died in a fishing accident. He was caught and sucked into the water when he tossed the large and heavy fishing net into the water. Noemi is an only child and afterwards it was only Noemi and her mother. 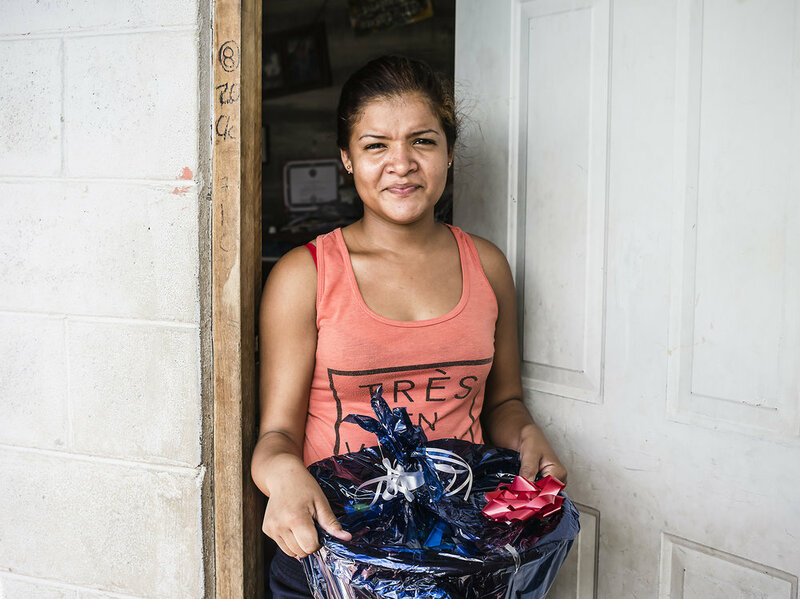 Noemi recalls various stories of working inside La Chureca, the worst being when she witnessed a man being crushed and killed from a dump truck who did not see him. 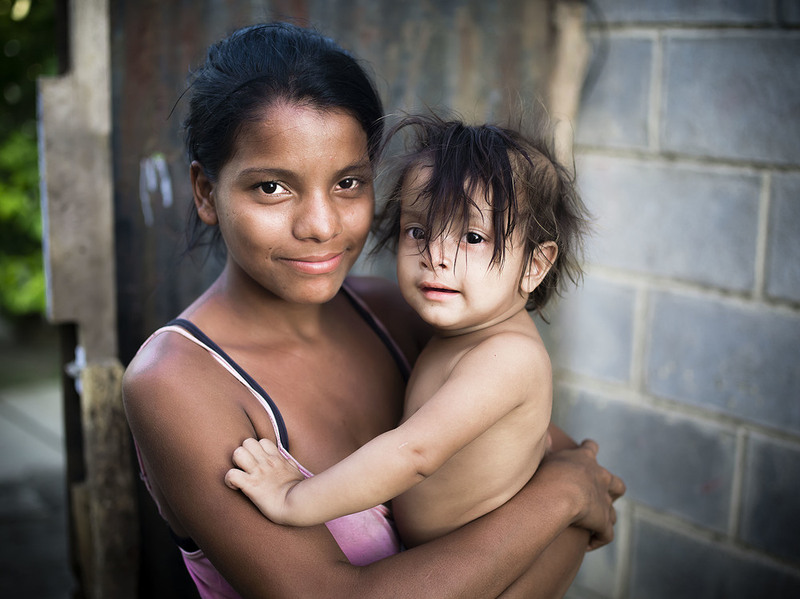 Today, Noemi and her mother live in Villa Guadalupe, a housing development for the people of La Chureca. Which is a huge improvement from her house made out of found materials from the dump. 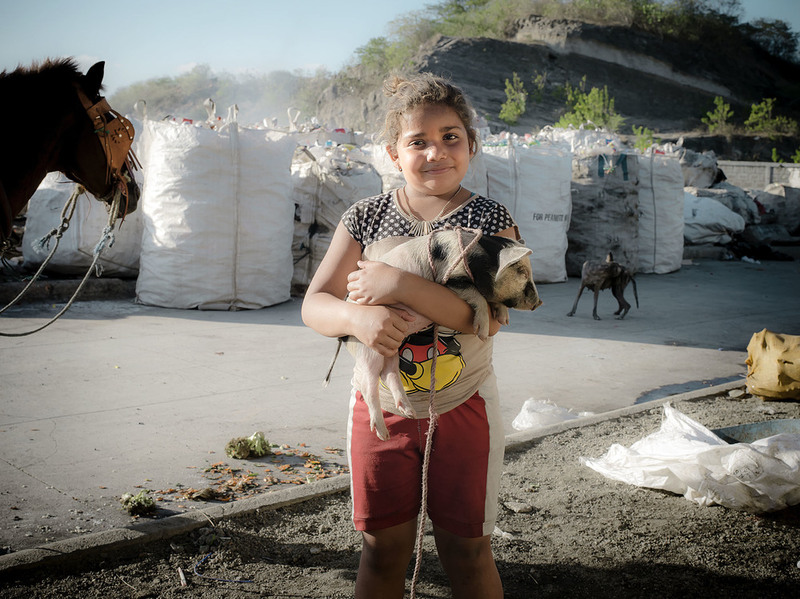 Her mother works in the recycling plant that was created to give waste pickers formal jobs, but the income is not sufficient and both Noemi and her mother find themselves informally picking trash in La Chureca daily. 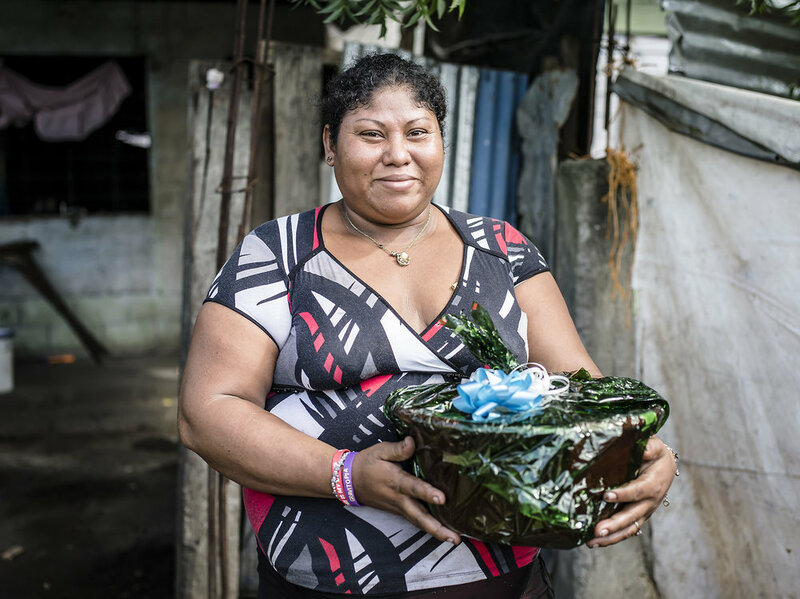 When conducting this interview, Noemi was cutting and washing plastic at home that she had collected from the dump. 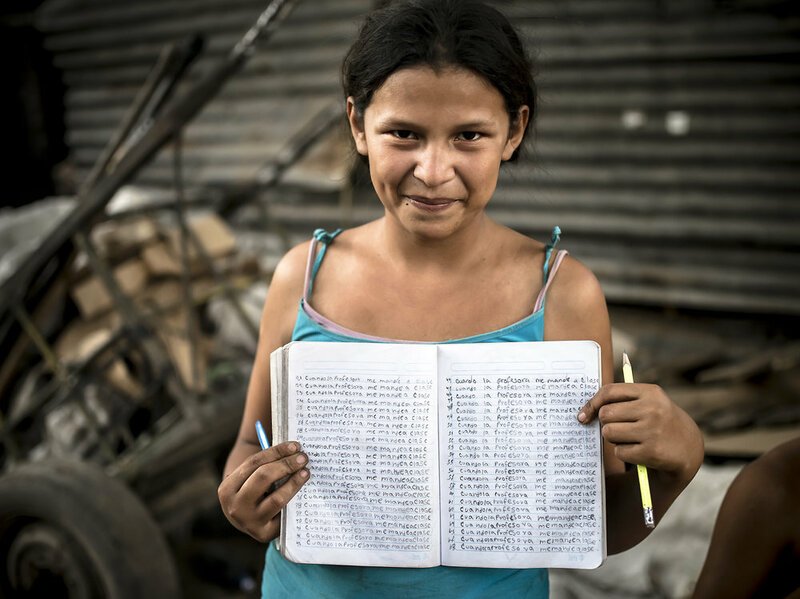 Noemi realizes that her best chance of a better future is through education. She dreams of becoming an architect one day. 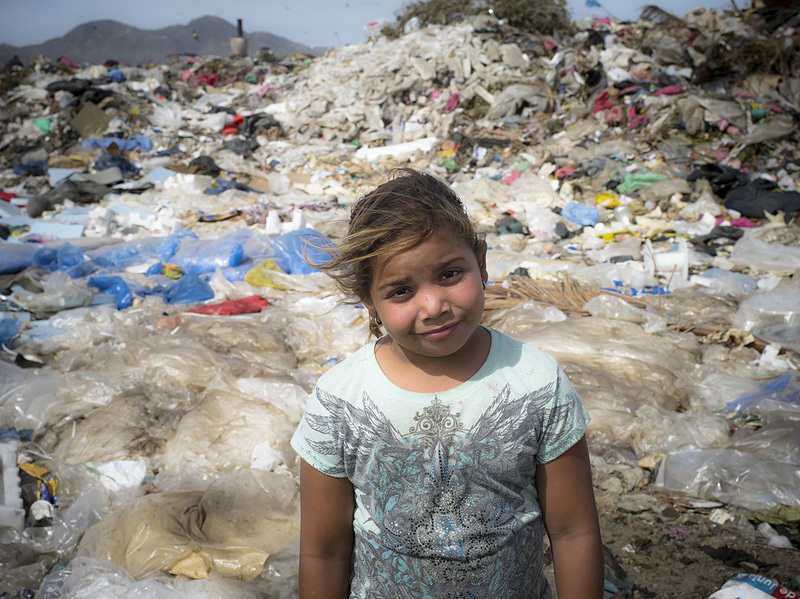 Genesis was born in Managua City’s dump known as La Chureca on September 23th, 2009.Her parents have always lived in the trash dump. They had a home made from card board which they kept losing because of the rain. The mother eventually found a job as a maid. The employer had an extra freestanding room for a maid in the back of the house. 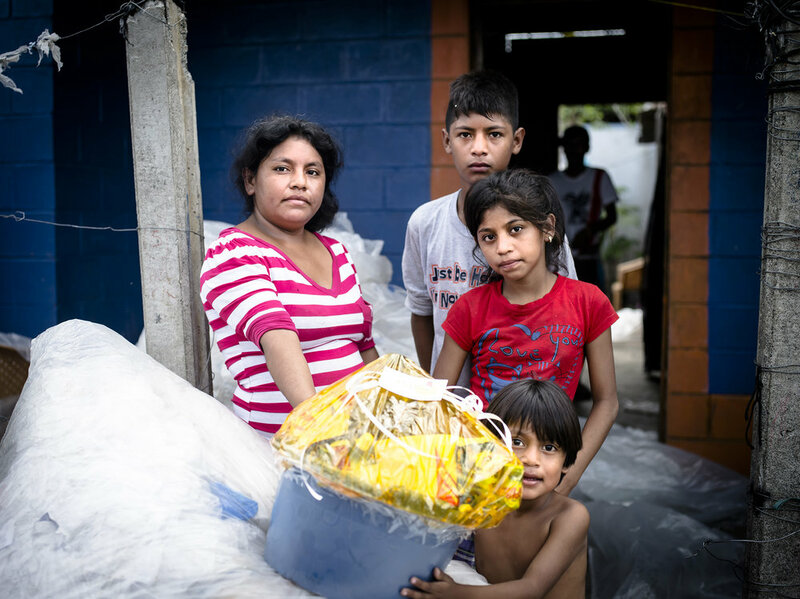 She gave permission for the family to remove these materials and use them to make a better house at La Chureca. 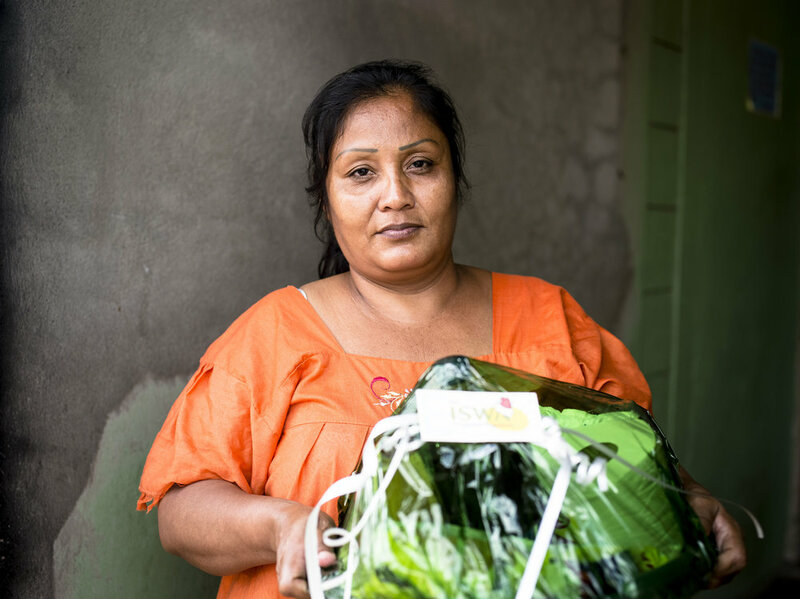 The biggest complaint the family mentioned about living at La Chureca is that they did not have electricity; which made it difficult to see at night when they felt hungry. 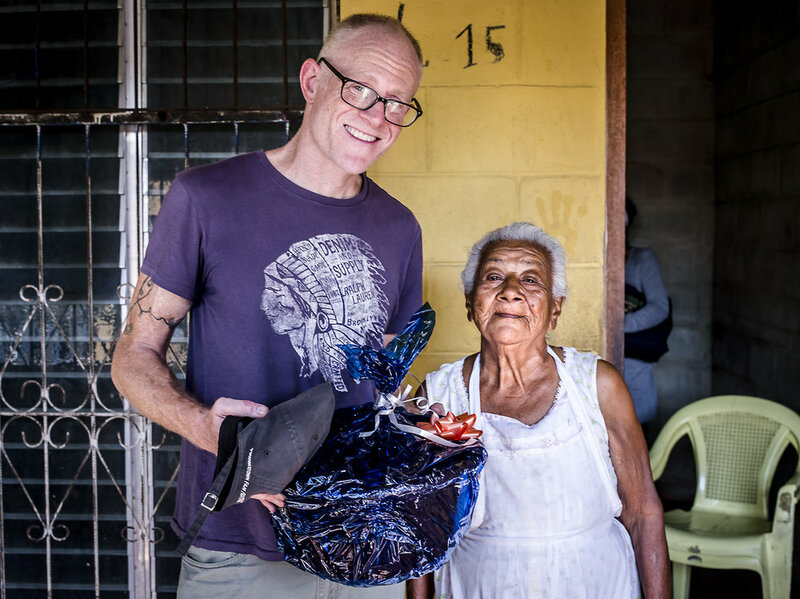 They shared horrible stories of finding Nicaraguan cheese in the dump that they ate and realized while eating it that it was filled with maggots. Another time the father thought he found a soggy hotdog and when he took the first bite realized it was feminine tissue. The worst was when the father found a large amount of uncooked chicken. The mother cooked it over a fire and they ate it for lunch and dinner. Afterwards, they woke in the middle of the night feeling deathly ill. They had to run to their neighbors in search for someone with a phone to call an ambulance and for someone to care for Genesis. Genesis was just a tiny baby at that time. The mother warned the neighbor that it might be possible that they may not make it and she would need to care for Genesis in the event that they died. The poisoning was harsh on them, but the hospital was able to clean their system and they survived. The primary students at their first day of private school. 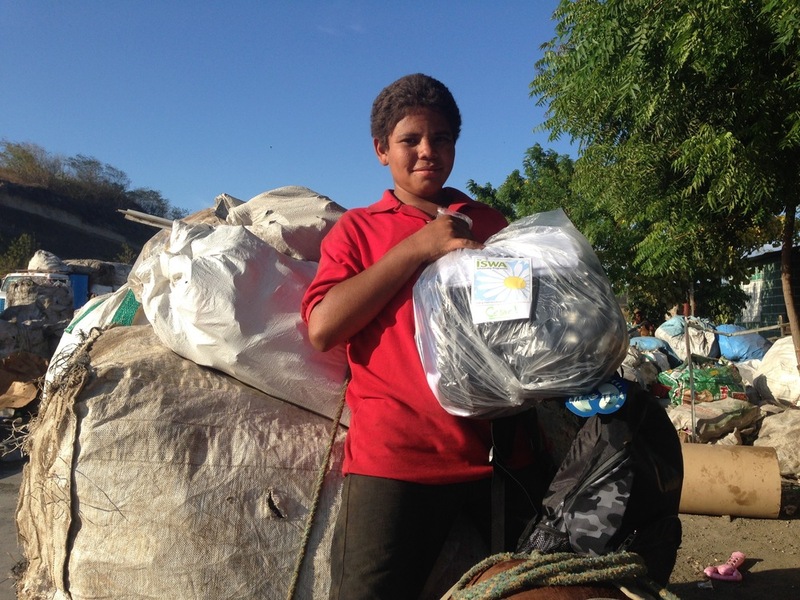 Cesar was born August 30th, 2002 and lived in a place alongside Managua Lake called, Manchester. Manchester was a place swept away from heavy rains 5 years ago. The community at that time had lost their homes that they made from found materials. 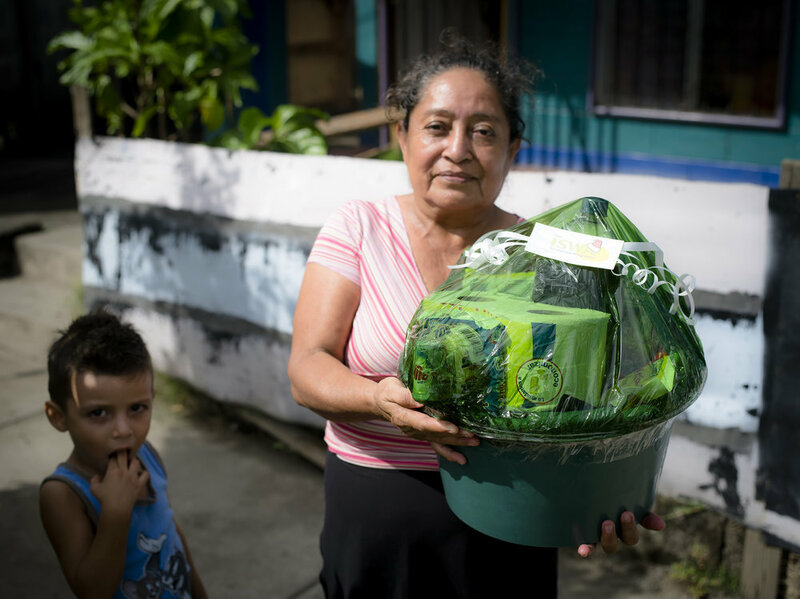 During this same time, a housing project was being developed for the people informally recycling in La Chureca, Central America’s largest trash dump. Cesar was moved there 5 years ago with his family. They were jobless and the new location gave them close access to the materials coming into La Chureca. The mother and her children started climbing the trash dump to bring back materials to repurpose or to resell. Cesar has3 siblings and 1 biological sister from the father. Both fathers of the four children left the family due to problems involvingdrugs and alcohol. Cesar works hard in both school and at home. On Saturday’s he wakes up at 6 am and brings a horse up to the trash dump to work until 5pm at night. He acts as the father for thefamily and is very responsible. He is lacking a little in his studies but the program is just what he needs to not fall behind. I see Cesar becoming more comfortable with himself and grateful for this opportunity. Aracellys was born on February 17th, 2008. She has 3 brothers and is the only girl. 4 years ago Aracellys and her family lived in an area called Manchester which is located on the coast of Managua Lake. She lived in a handmade hut of branches and plastic. Torrential rains flooded out the entire area and the community lost their homes. They were fortunate enough for the government to relocate them in a concrete house at the newly developed Villa Guadalupe. 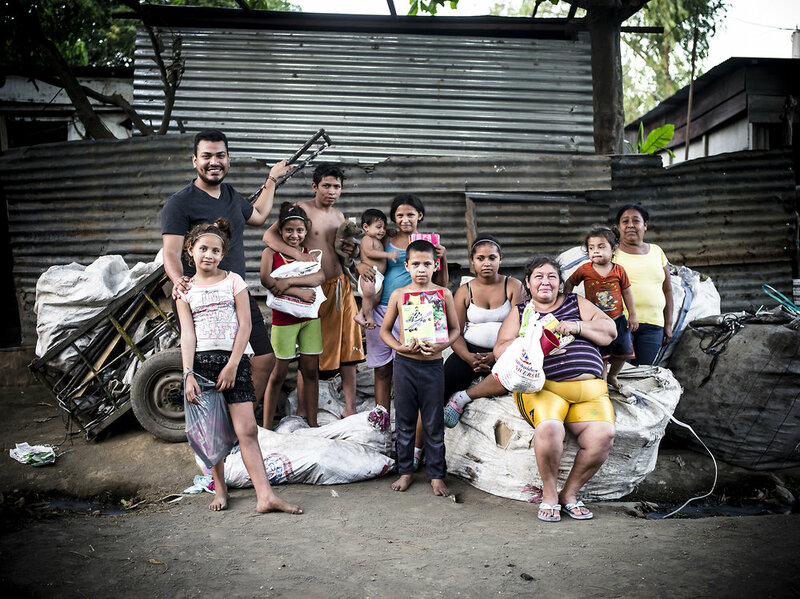 Villa Guadalupe is a new barrio created in an attempt to remove a community of 1800 people away from Managua’s trash dump, La Chureca. 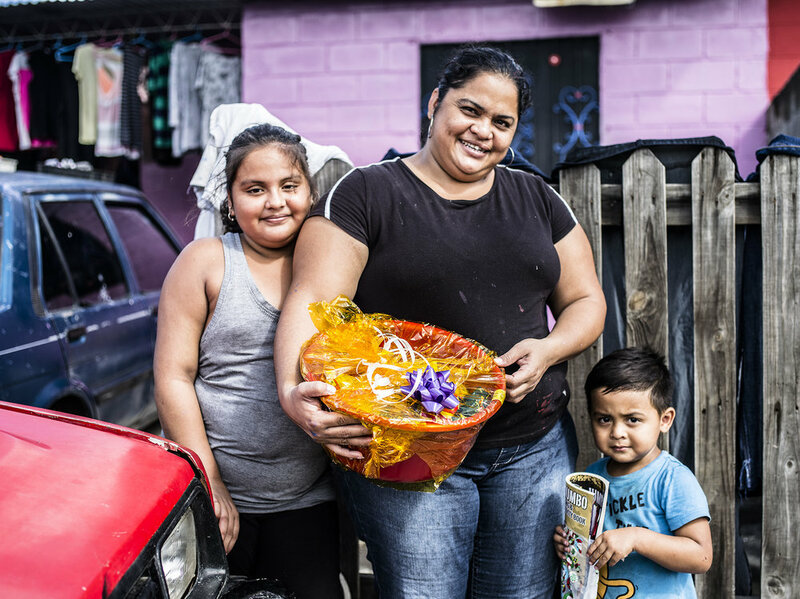 When the family relocated they needed to find work, so naturally they began informally recycling the material that came into La Chureca due to its close proximity. 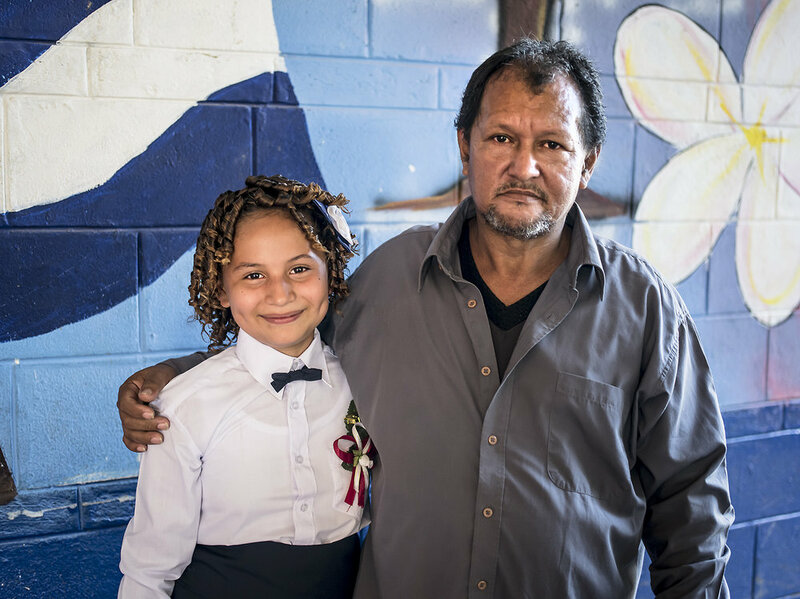 Aracellys’ father struggles with addiction and at times had physically abused the family. The father left the family, but lives in Villa Guadalupe as well. 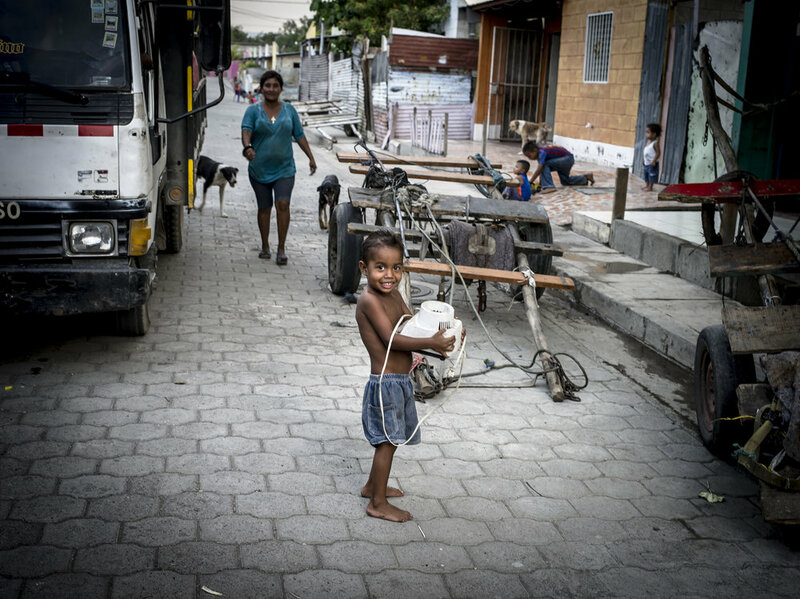 He brings them 100 Cordabas ($3.50 USD) once a week to help pay for food but his visits are irregular. 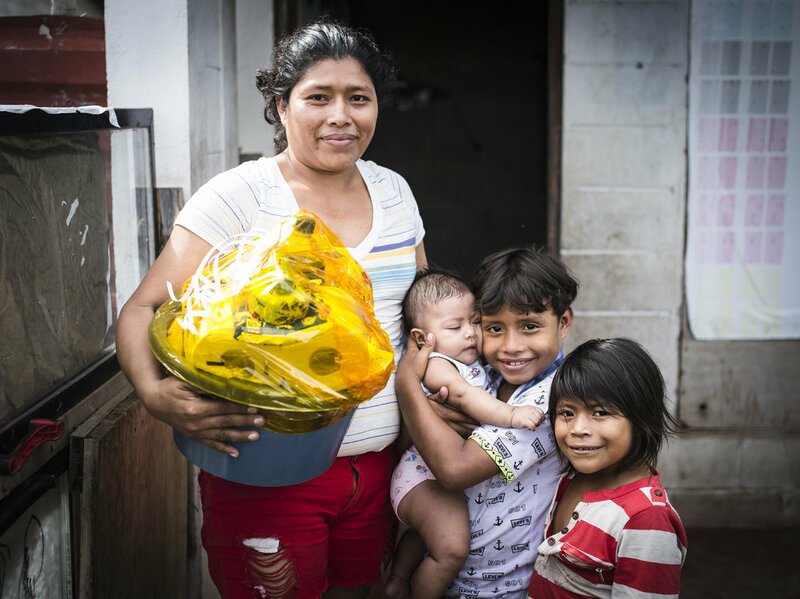 The mother stays at home to look over the newborn, while Aracellys and her 11 year old brother scavenge the trash dump looking for materials to sell outside their home. Aracellys is shy but that is changing quickly. She has a beautiful smile and cute personality. Currently, she can not read or write, so we are focusing on improving these areas so she will not drop down to the first grade. Thank you for reading our stories. We are proud of what we have overcome and are working together to advance each other towards a better future! Program Director, Timothy Bouldry, poses with various ISWA Kids and family. ISWA Kids who are sleeping on the floor are now receiving new beds made from recycled wood crates courtesy of Optima Industrial. Read about it HERE. THERE ARE LOTS MORE TO COME FROM THE PROGRAMME. WE ARE JUST AT THE BEGINNING. If you are interested in sponsorship you may contact Timothy Bouldry at shootforchange@yahoo.com or if you would like to send a donation you may contact ISWA (International Solid Waste Association). Donations are also accepted through PAYPAL using the email shootforchange@yahoo.com to send funding. FROM ALL OF US: THANK YOU FOR YOUR LOVE, INTEREST AND SUPPORT! 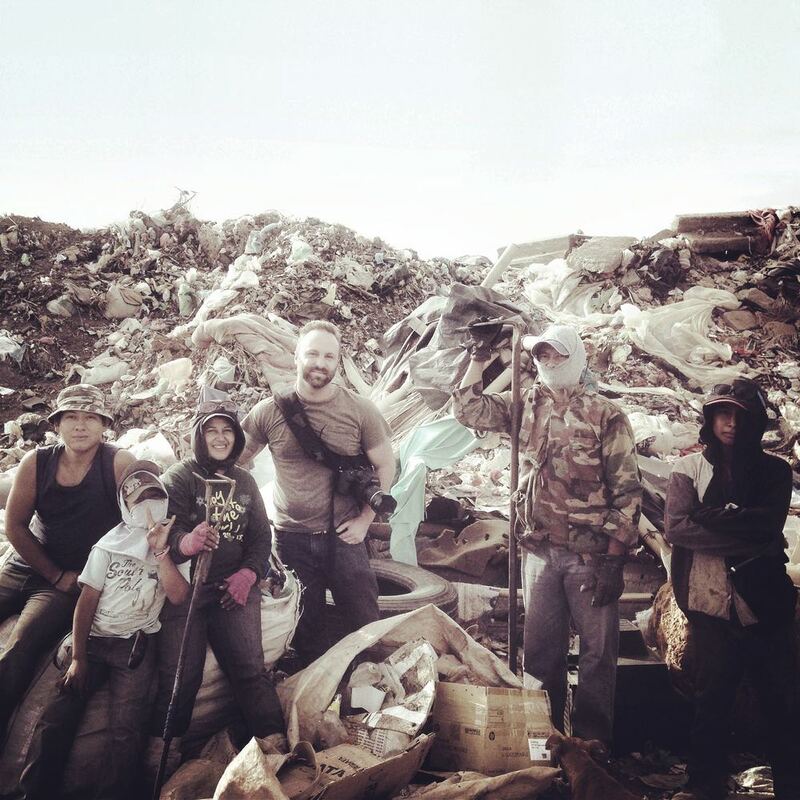 Checking on Dumpsites of Esteli and Nueva Vida while ISWA kids take exams. 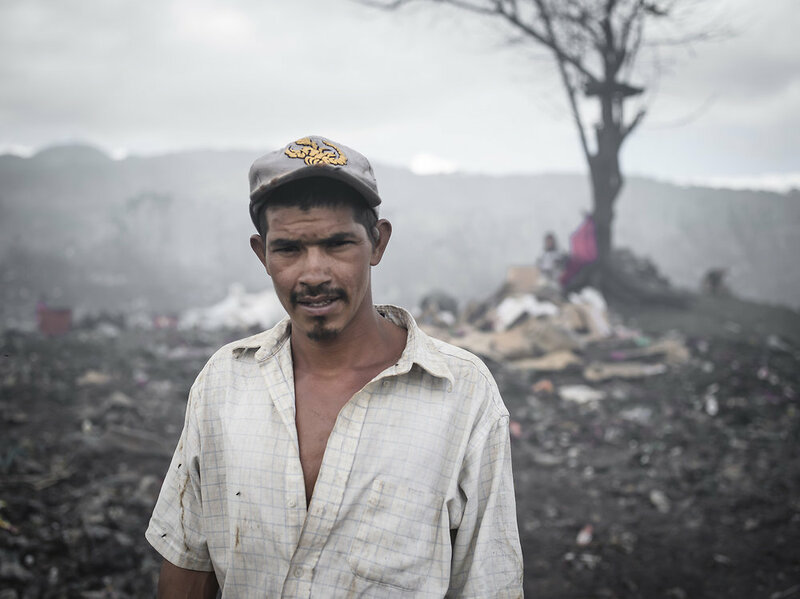 I have been poking my nose in the northern part of Nicaragua in search of the possibility to expand The ISWA Scholarship Programme to a new dumpsite. 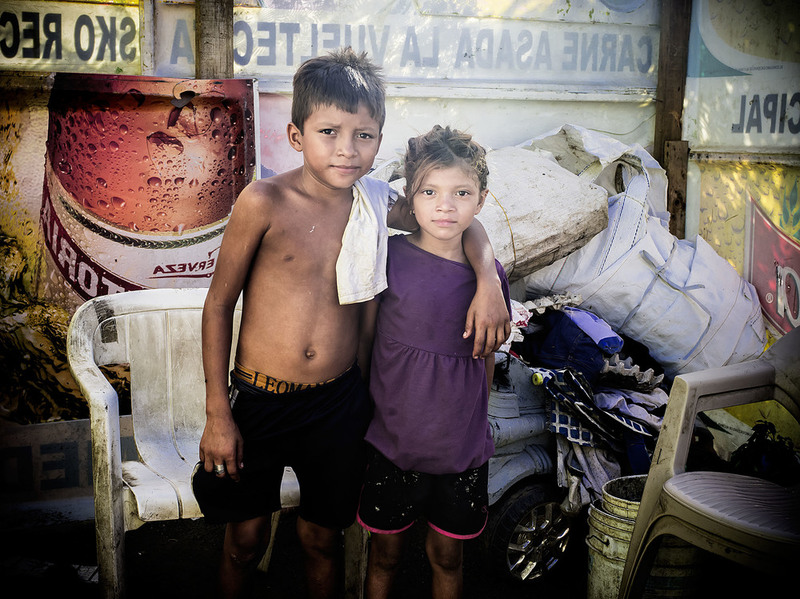 This lead me to the dumpsite of Esteli where I haven't been to in a few years and nothing really has changed. 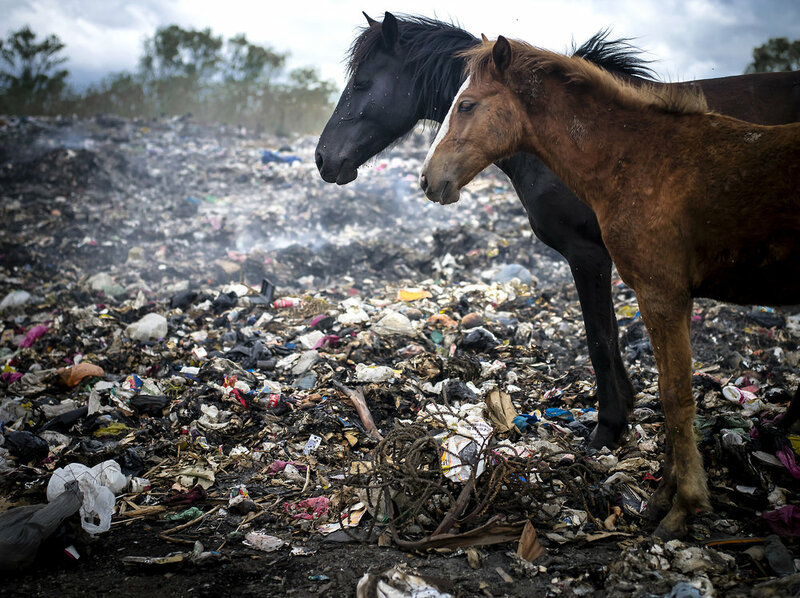 There were a larger amount of horses in the trash, as well as people. I'll let the photos and captions speak for themselves. 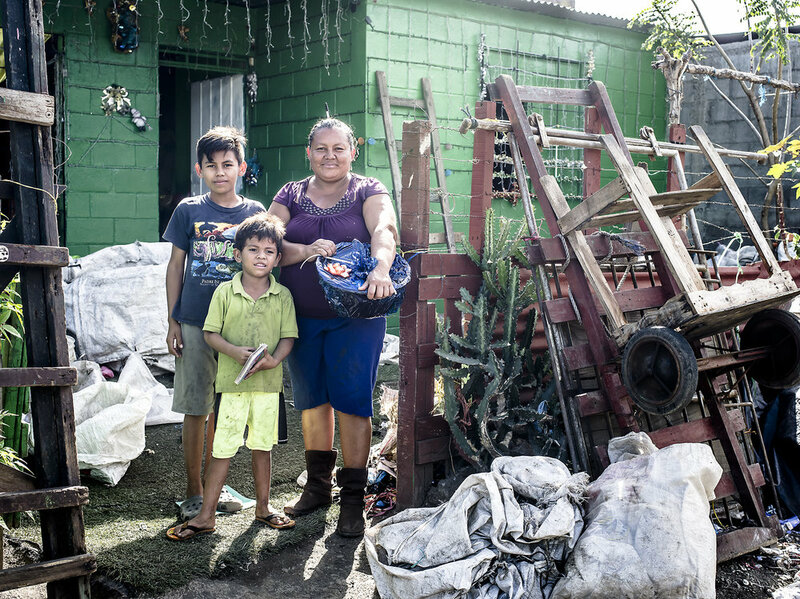 Elizabeth and her son together in their home outside the Esteli dump where they both informally sort garbage. I recently passed through the Nueva Vida dump where I always find Roberto and Demecio playing, as well as this super hero dog guarding the collected recyclables! 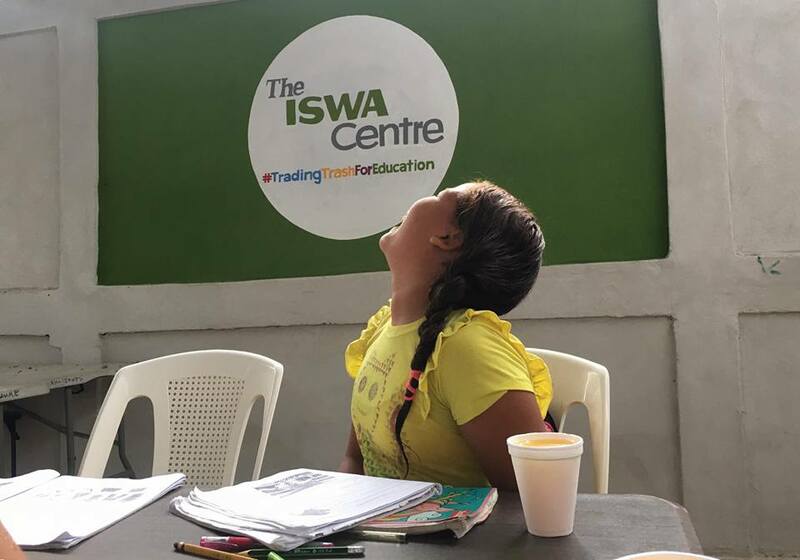 Back at La Chureca aka Villa Guadalupe, the ISWA kids are being tested to be sure they are ready for the following year for their respective grade level. 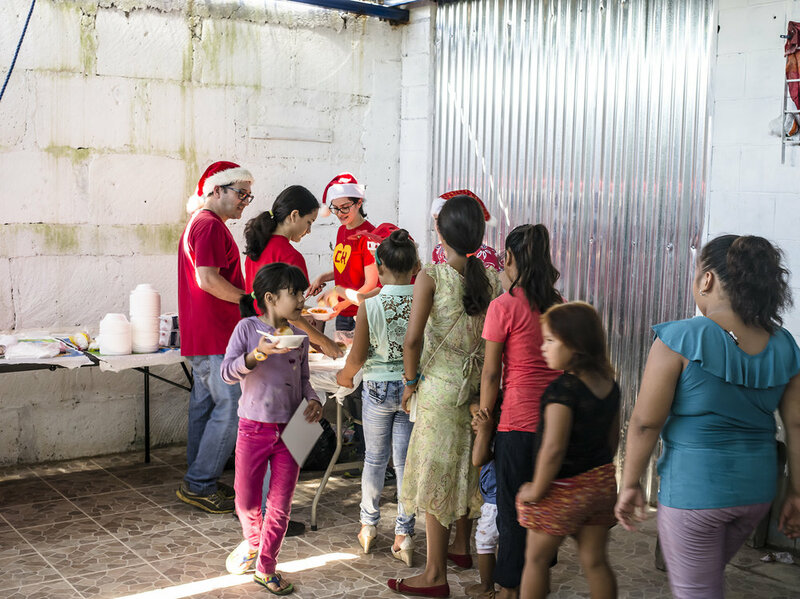 We were able to bring all the kids together for a Christmas celebration. It included kids from both The ISWA Scholarship Programme and another program, Paso a Paso. The turnout was the largest we have ever had. We were so lucky and grateful for our friends who came to help us run the event. Besides plenty of smiles and laughs, we played lots of games, sang along to live music, ate snack, juices, had a fresh hot meal, broke through two piñatas, passed out a few certificates for those who passed our English class program and we played Santa in the end to all the kids that received gifts. It was a magical and fun day for all! Special thanks to the sponsors and people who volunteered their time to make this event run smoothly. Happy Holidays to all! Pictured Left to Right: Eva, Alejandro, Alejandra, Carla, Monica, Timothy, Andrea, Jorge and Engelbert. Thank you all! 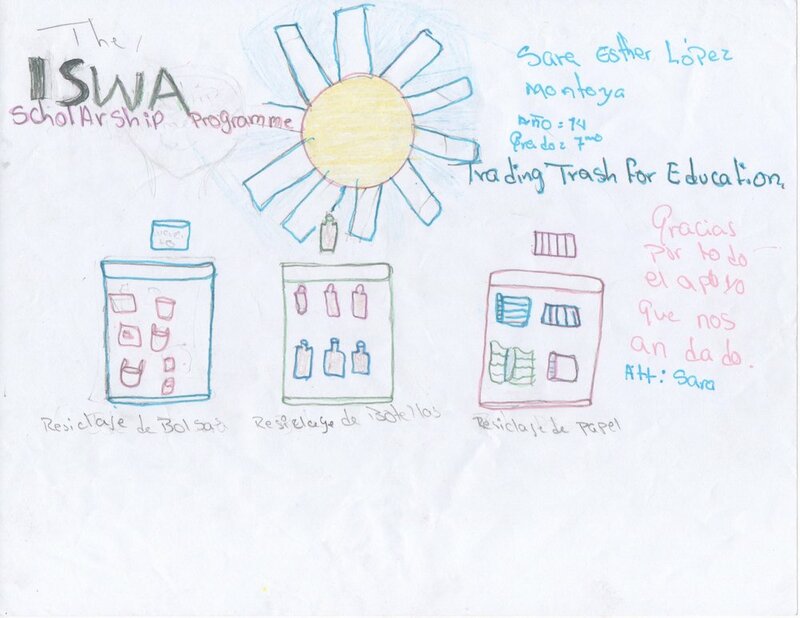 It's that time of year for giving and ISWA wanted to express it's gratitude to those who informally recycle. 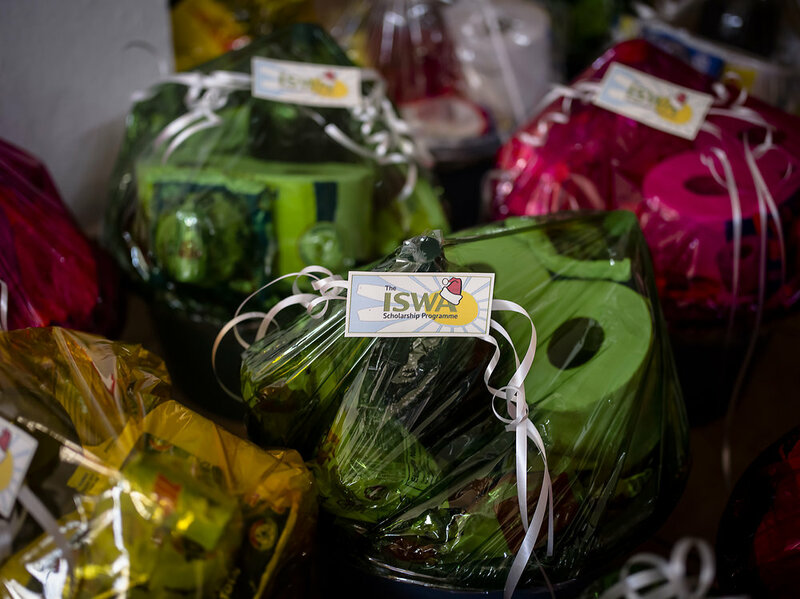 Families with children in The ISWA Scholarship Programme each received a heavy Christmas gift basket filled with food and cleaning supplies. I could tell it really touched their heart because this unexpected gift brought such a genuine smile to their faces. 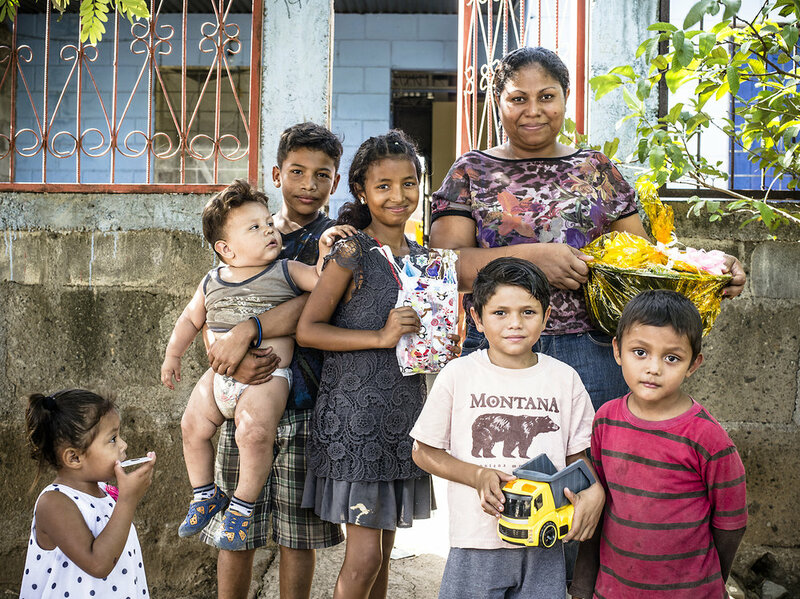 Take a look at some of the families who received ISWA's gift. Lovebirds from La Chureca Married after 16 Years! The Juarez family was really my introduction to La Chureca 8 years ago. I clearly remember their house many of sticks and plastic alongside a mountain of garbage. Well after 16 years they have finally tied the knot! 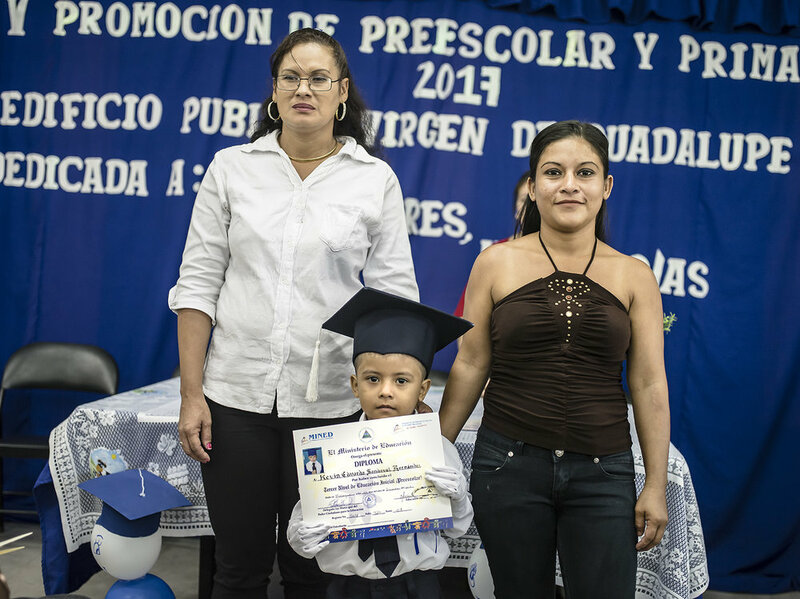 Their youngest of 5, Timoteo (my namesake and Godson) is becoming an ISWA kid in 2017 by The ISWA Scholarship Programme placing him into kindergarten. We thought it would be the right thing to start this family's year out right with honoring the parents vows to one another and their family. Much love and happiness to the Juarez Family! The lawyer marries Karla and Felix Juarez Lopez in front of witnesses and Timoteo. The ISWA kids were lucky enough to have Beauty Beyond Borders creator Alicia Chouinard visit us for another day of art! Today we made our own T-Shirts. 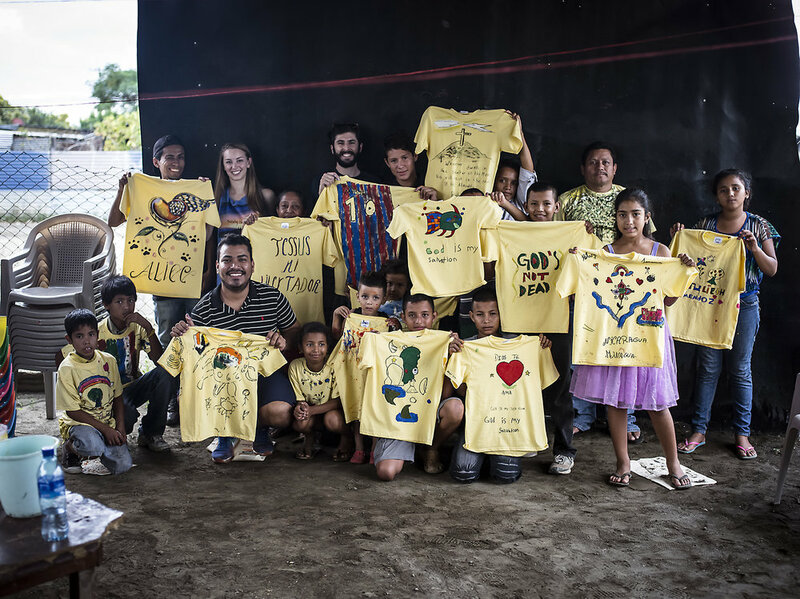 Our class was packed with kids and parents all expressing their talents to proudly wear on their backs or give away to friends. Thank you Beauty Beyond Borders for organizing this event, putting smiles on our faces and keeping our creative minds exercised! 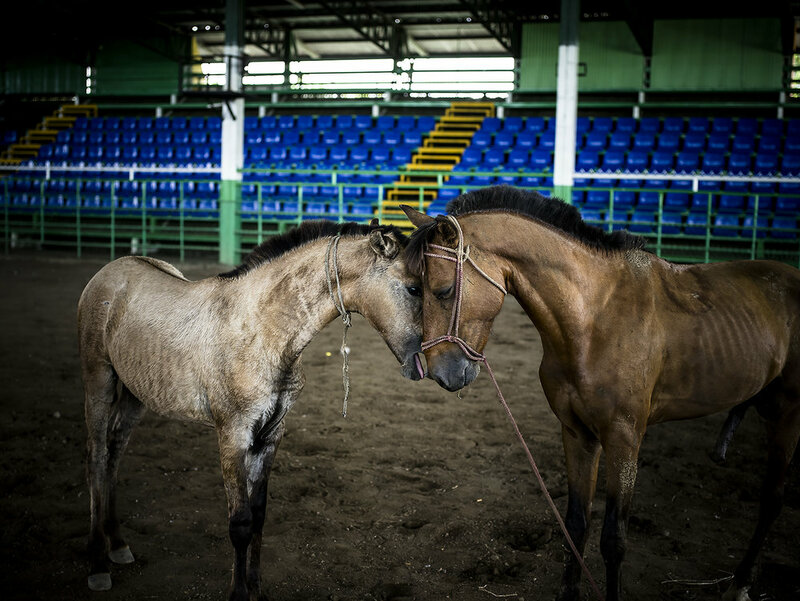 ISWA Kid sponsor, Jo Ann Sibert, put together a beautiful event for the horses of La Chureca. 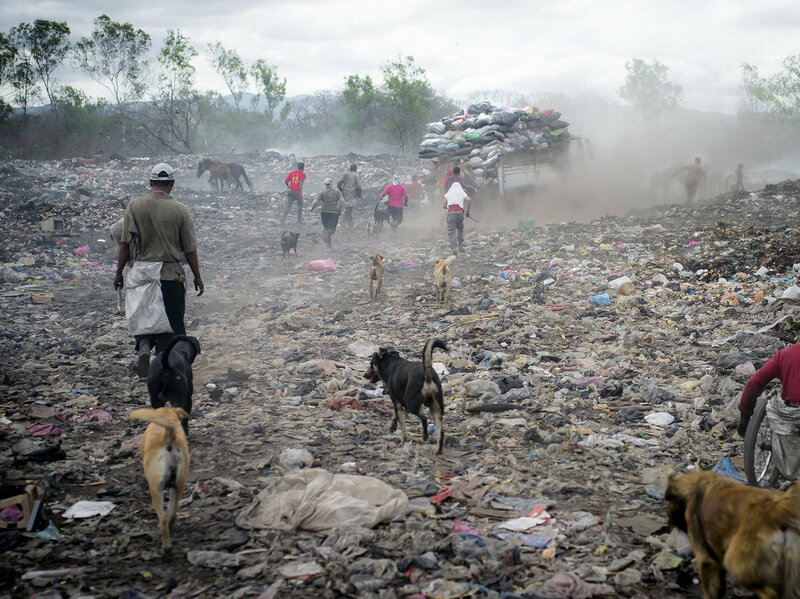 Many families who sort garbage on La Chureca's mountain of trash depend on their horses to help them scavenge, but few of them have the income to seek healthcare for their horses. This event brought in over 50 horses who needed medical attention during a 3 hour window. They were cared for and tested by Nicaraguan renowned veterinarian, Dr. Enrique Rimbaud. 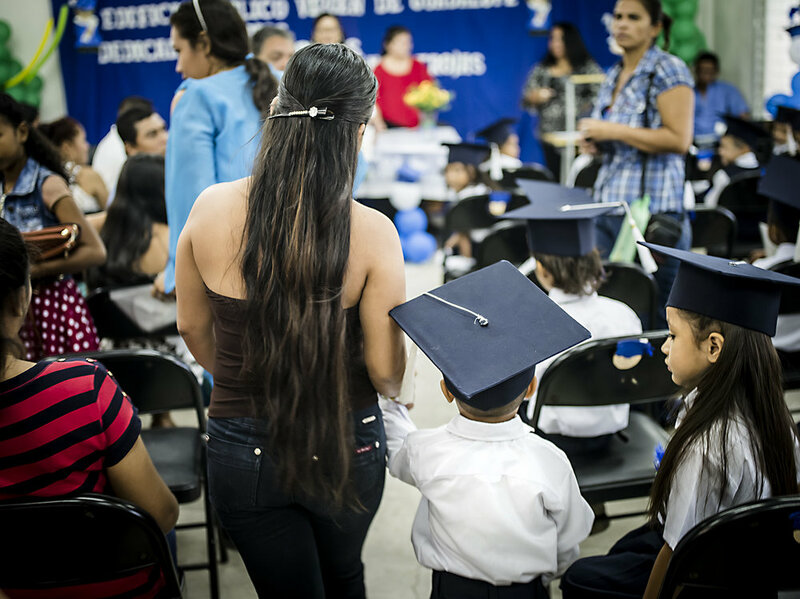 The event brought many familiar faces including kids and parents from The ISWA Scholarship Programme and of course, Villa Guadalupe. Jo Ann has a big love for horses and I was so proud and impressed that she was able to put this all together. The horses are so in need of it. 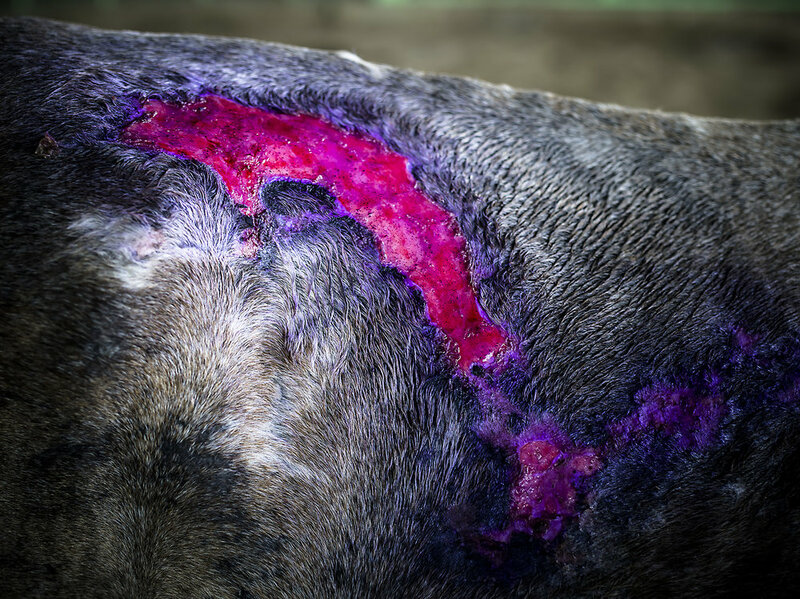 There were many cases of worms and parasites that were eating away at the horses. 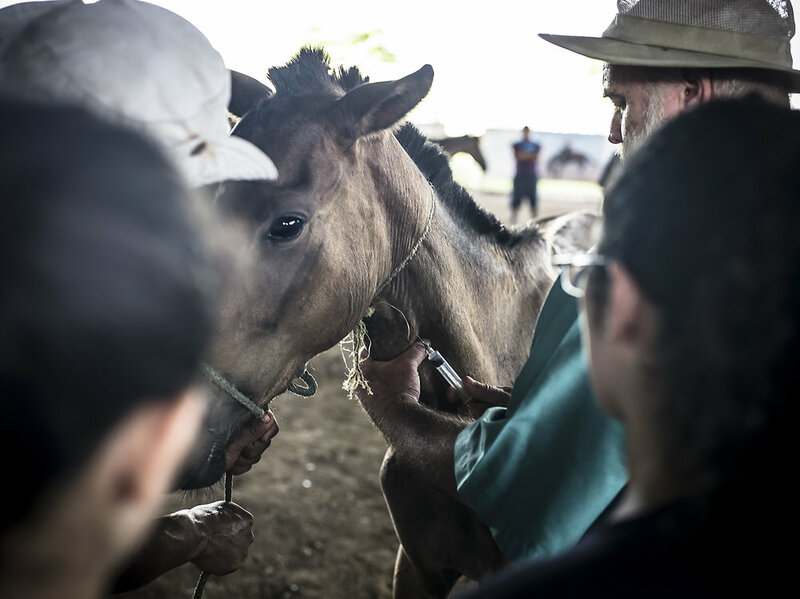 After all the horses' results come in, we will all meet again to at the school in Villa Guadalupe to talk about their test results, educate owners and plan the healthcare for the owners' horses. 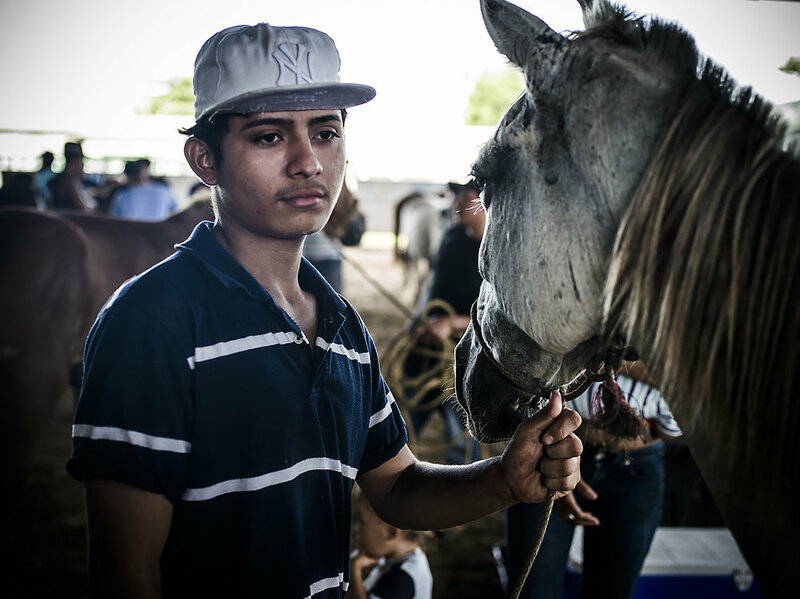 Thank you Jo Ann Sibert, Dr. Enrique Rimbaud, the extra people who helped (you know who you are) and all the wonderful volunteers who did such an amazing job at tending to the horses needs and making the event flow so smoothly. 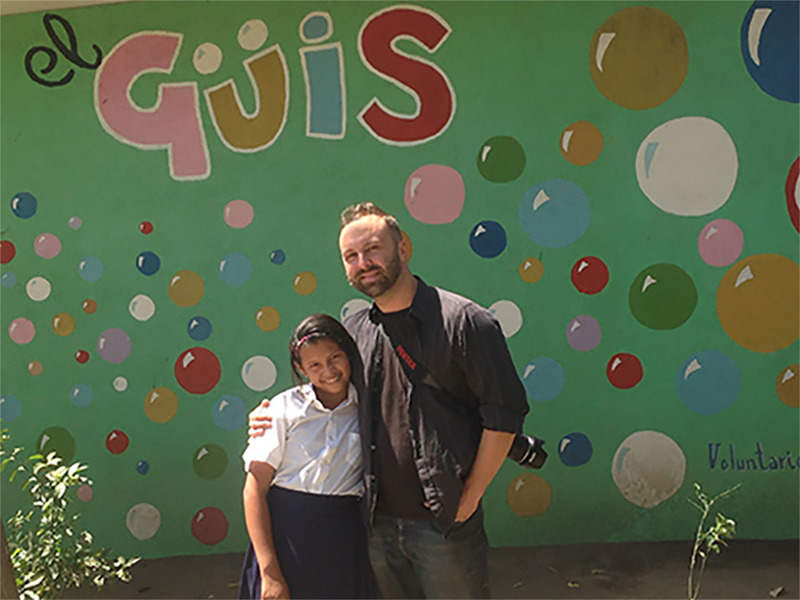 President of ISWA, Antonis Mavropoulos, visits Timothy Bouldry and the ISWA Kids in Nicaragua. The ISWA Kids are Visited by a Very Special Guest! The ISWA Kids were greeted by a very special guest this passed weekend. 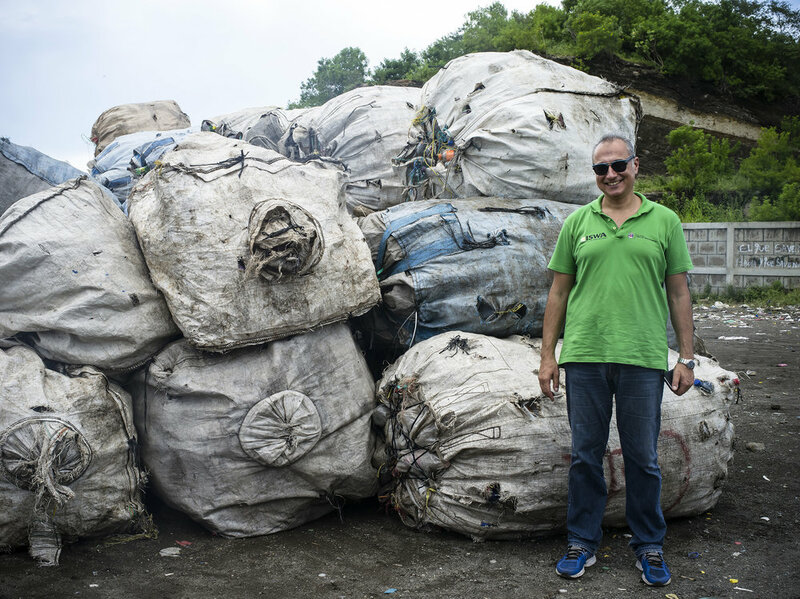 President of the International Solid Waste Association (ISWA), Antonis Mavropoulos, came all the way from Greece to meet the ISWA Kids and see what The ISWA Scholarship Programme has been doing this past year. He didn't come empty-handed either. He brought us Grecian sweets and many mindful lessons to chew on. Antonis showed much gratitude for the families in their effort to recycle. He thanked them for contributing to a cleaner Earth, even if the intention was indirect. 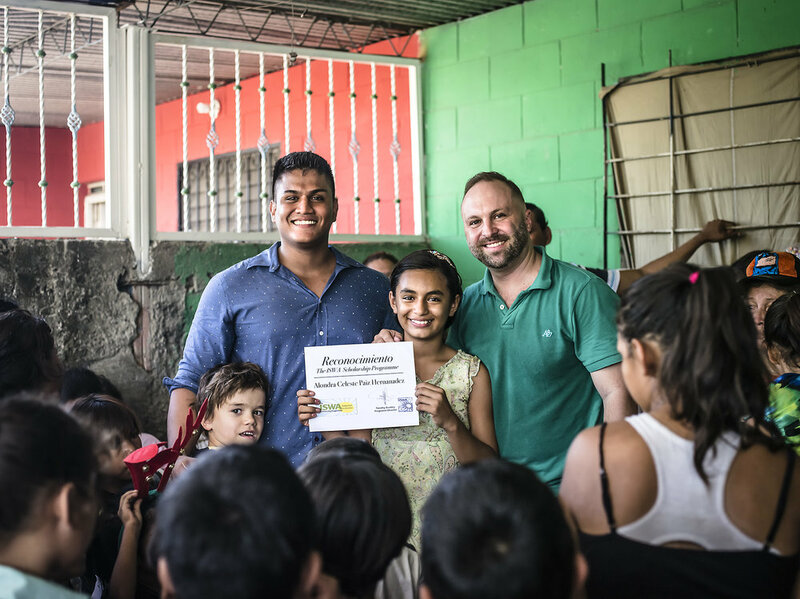 However, he reminded them of the health risks with informal recycling directly from the trash and encouraged families to stay motivated by education. 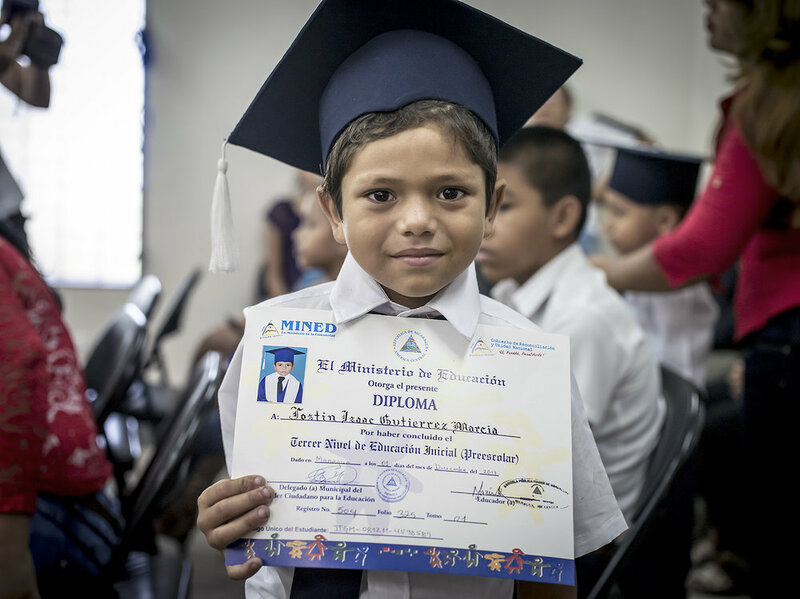 Both the parents and children must understand the importance of education for their futures. For the more time in the dump, is less time in the classroom. Which could lead to a road much tougher to travel. He also reminded them of the possibility that the dump may not be there for them when they are older. Therefore investing in education now is the quickest route out of poverty and their dependency on the trash. 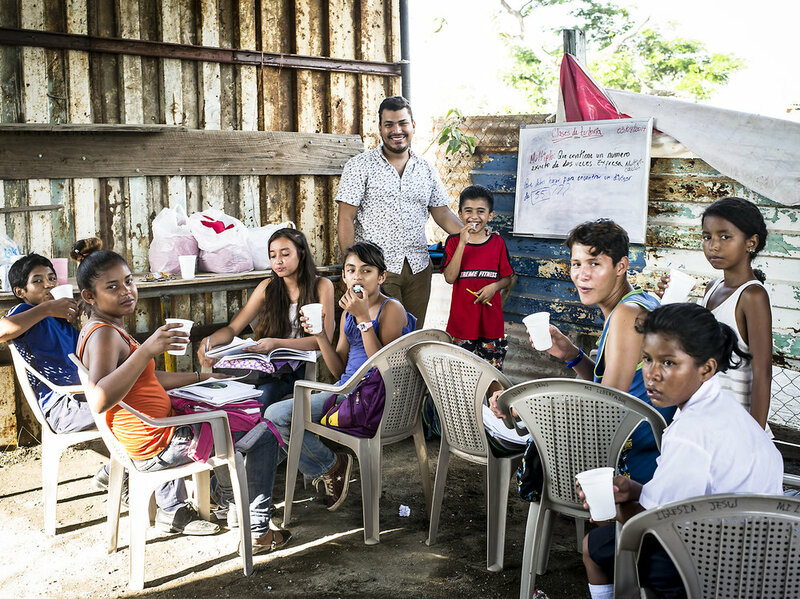 Antonis took the time to visit our scholarship kids living in Nueva Vida and a squatter community alongside the lake. 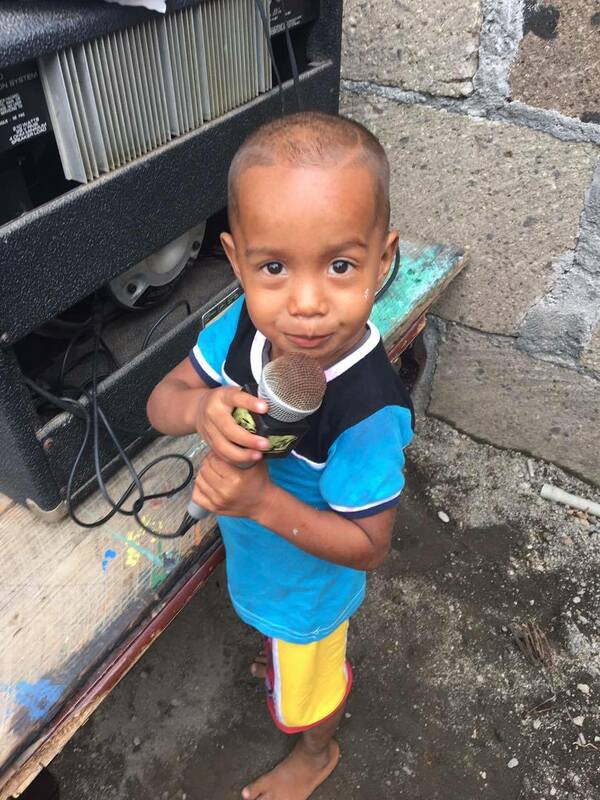 Though our tour directly inside La Chureca was impossible because of heavy rains, he got a little taste of the conditions at Nueva Vida dump site. We had a wonderful time with Antonis. It was really beneficial for the kids and parents to meet the President of ISWA because they understand more that the program is serious about helping them and will be there for them in the future. I could tell that by the end, the kids touched Antonis' heart too... as those little angels are always notorious for. Learn more about The ISWA Scholarship Programme at ISWAkids.com, the International Solid Waste Association at ISWA.org and the work of Antonis Mavropoulos at WastelessFuture.com. People are always welcomed to visit with project ideas that will benefit the community here and donations are always accepted too. 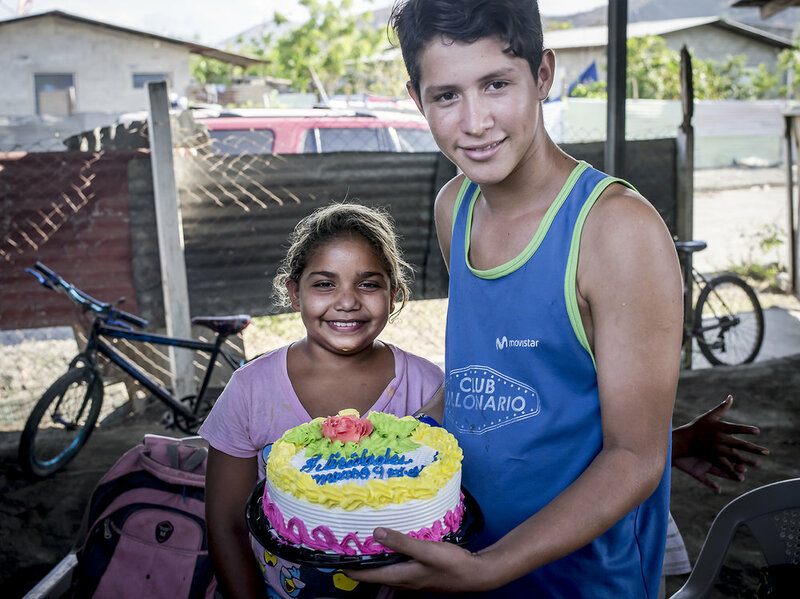 Roberto and Aracellys are surprised to come home from school in a renovated bedroom. Optima Industrial Make Beds from Recycable Material for The ISWA Scholarship Programme kids! 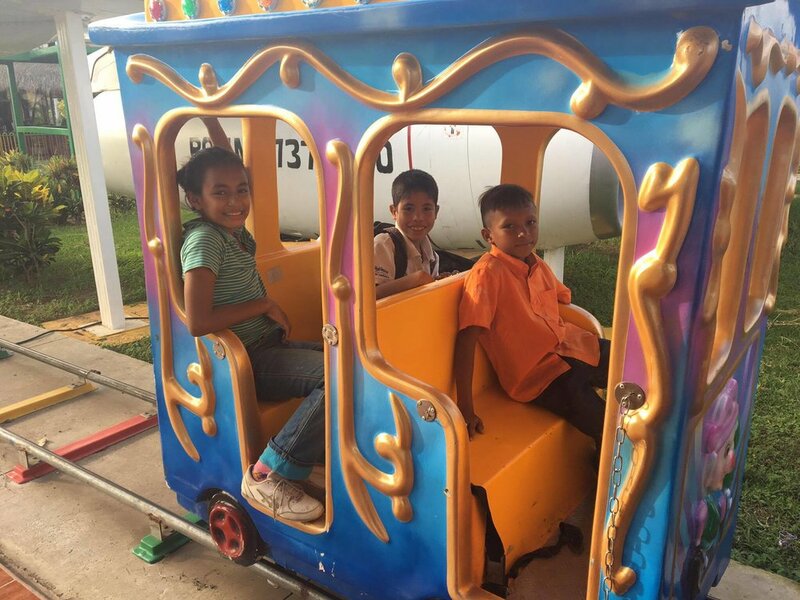 The Managua based industrial company, Optima Industrial S.A., has began a program to offer the children of The ISWA Scholarship Programme beds that they have designed and constructed by recycling crate wood they receive from other product orders. 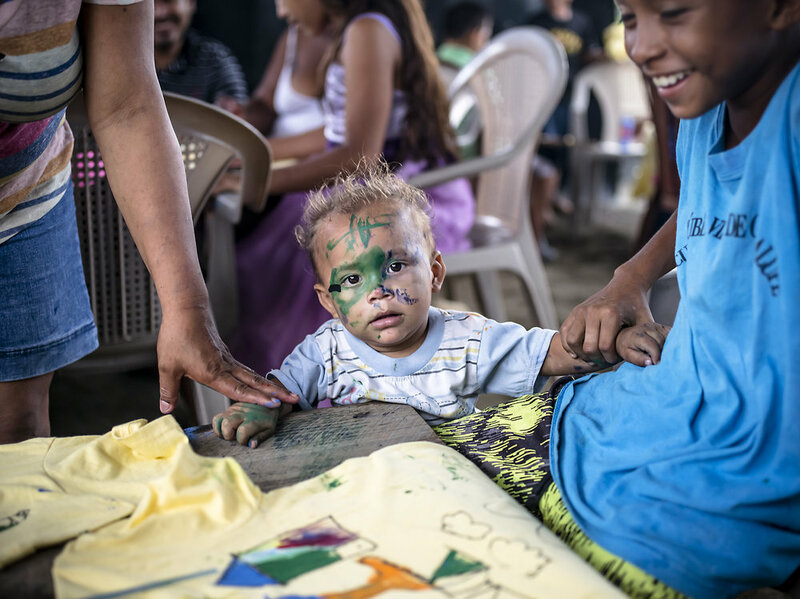 The program will help more children currently sleeping on floors from the informal recycling community of La Chureca. 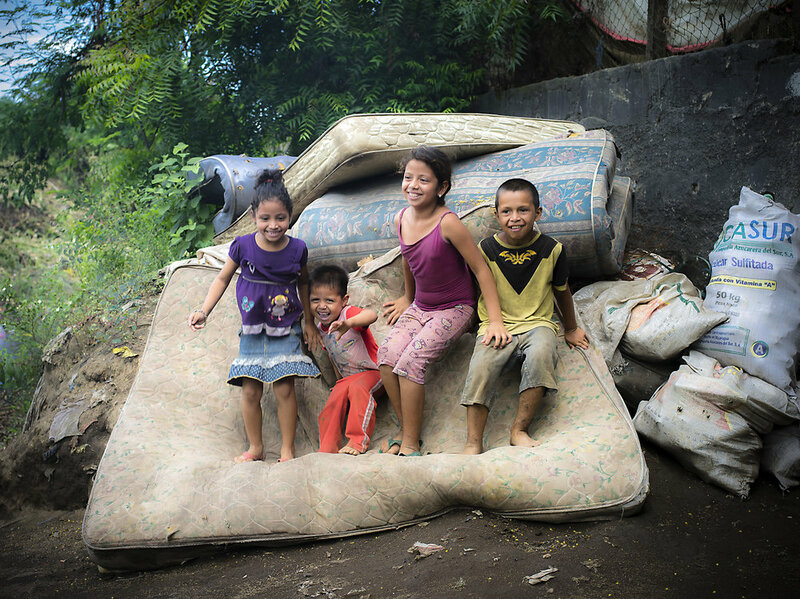 Owner, Jorge Sacasa Cross, and Project Manager, Daniela Aranda Cross, teamed with their carpenters to create a bunkbed and single twin bed prototype that they have used to lift three children on their floor in their home in Villa Guadalupe; just footsteps from where garbage is extracted from the dump to be resold. During the removal of the old, damp, smelly mat where the three children were sleeping on together, a scorpion escaped from the mat. This made us realize another important reason these children should not be sleeping directly on the floor. Now Program Director, Timothy Bouldry, of The ISWA Scholarship Programme will be interviewing more families to find who is at most need for more beds like these. Moises excited to play on his new bed. Three families find a new home! 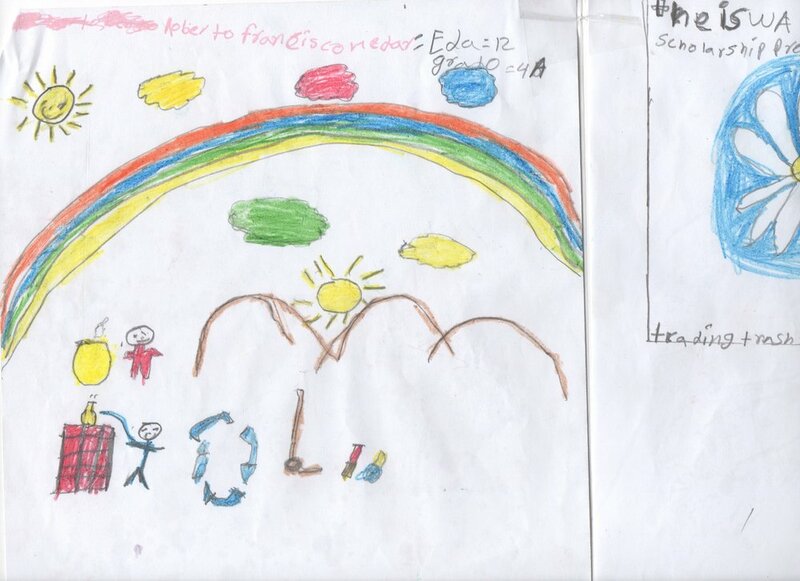 Four #ISWAkids were faced with a bad path after they lost their father. After he died, the kids were going back to the dump and not to school. The families were being violently harassed by neighbors and had to move for their safety. There was a lot of tension surrounding the father's death and the reason for it. They moved into a woman's house on a temporary basis. Then later, the family moved their shanty house on her property too. Most of their things had been stolen in the old houses and the pressure for them to leave the new property increased. Their were physical fights among them and the new neighbors who were also in gangs. During this time I was looking for a solution for them and had come across a few house rentals. 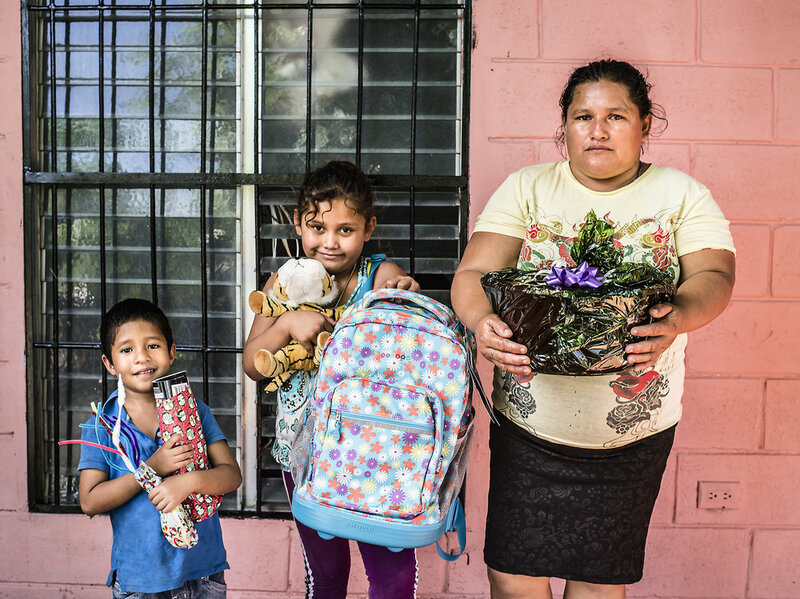 As I was looking around Villa Guadalupe, part of the family was wandering on the street afraid to go back to their little home that they boarded up from intruders. Emotional, they told me that they had to leave that day, but the house rental I had was not ready until 5 days. So I really had to think of where I could house them until them. Gilma, a sweet 96 year old friend came to mind. Knowing that she lived in a large secure house alone, I thought maybe she would be kind enough to help this family in those five days. I told her it was 7 family members and some stuff. She agreed. When we got to the mountain where the family was squatting, it turned into 12 family members, all their stuff which seemed liked all parts of things found in the dump, the house that they broke down to bring with them, a horse, 4 dogs and a carriage. Gilma's heart was bigger then I knew, because she had a space for all of that! Fortunately, after we moved them in, the other house rental was ready. So the next morning we moved again to their new home in Villa Guadalupe. In the end, it affected the son's house as well. While we were gone, he was robbed as well. So they lost their land, but were able to move the material of two homes with them. Thank you Nele for being with us during this difficult process. Now the kids are going to be going back to school because it is close by. Including one of the son's kids as well. As for the parents, La Chureca is currently restricted. People can only go from 1am-5am to work when the police are not guarding it. But for now, they have their own safe home. Cynthia sits in front of her home in Villa Guadalupe. Let's not forget another beautiful day of art!